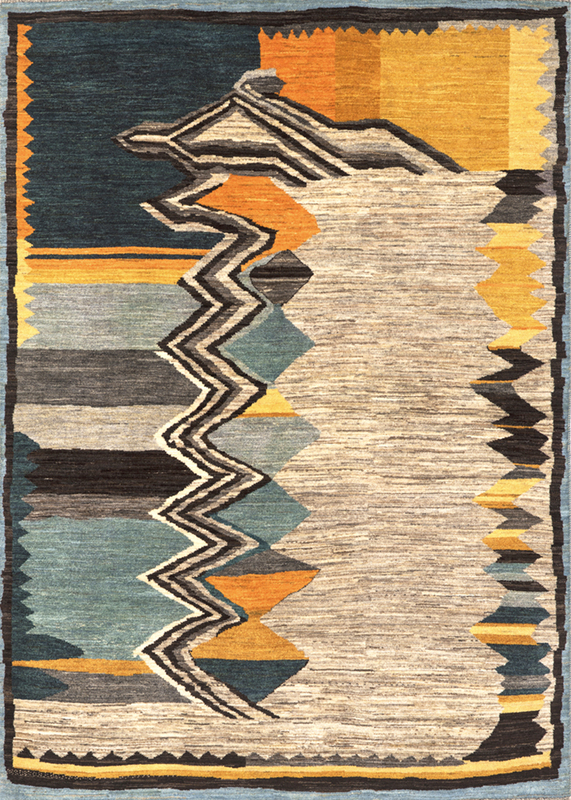 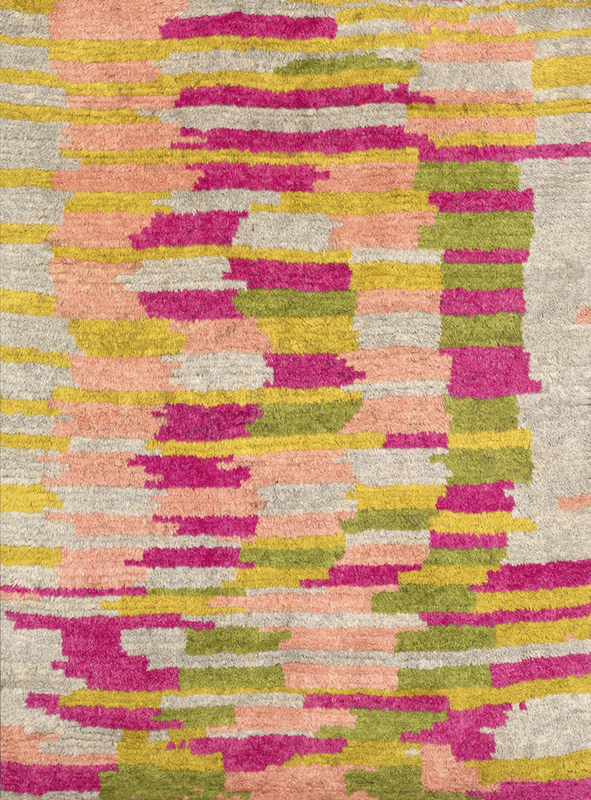 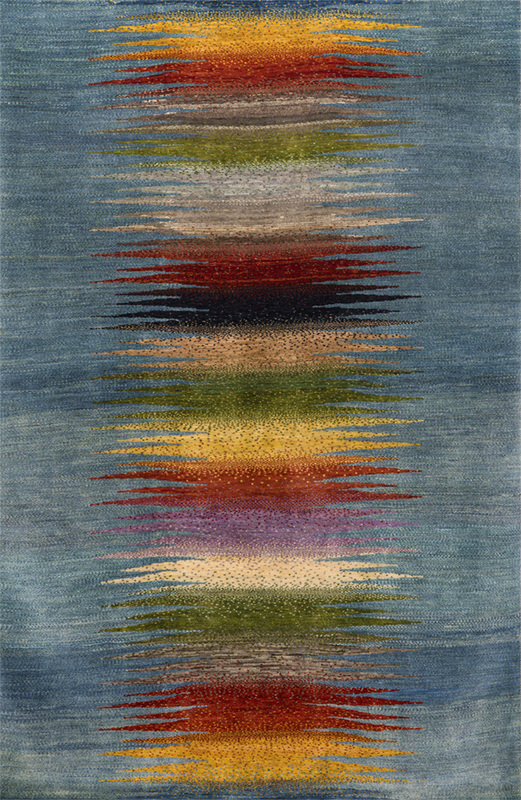 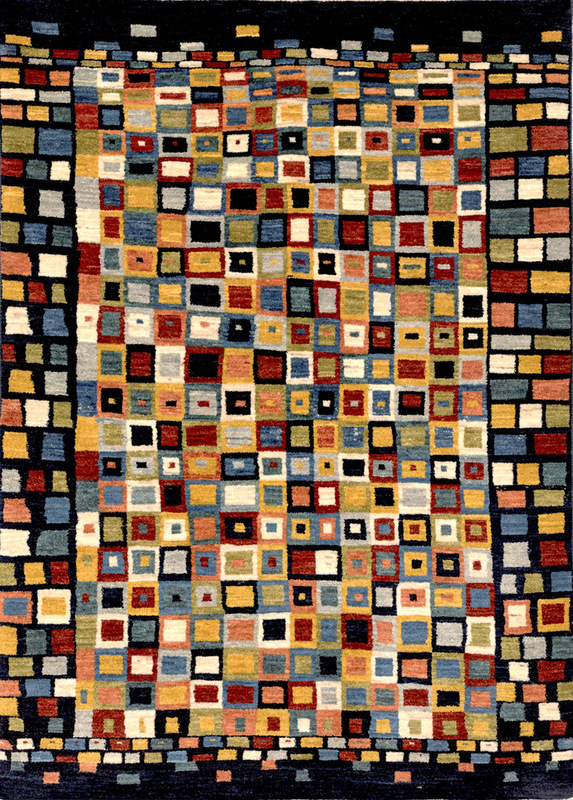 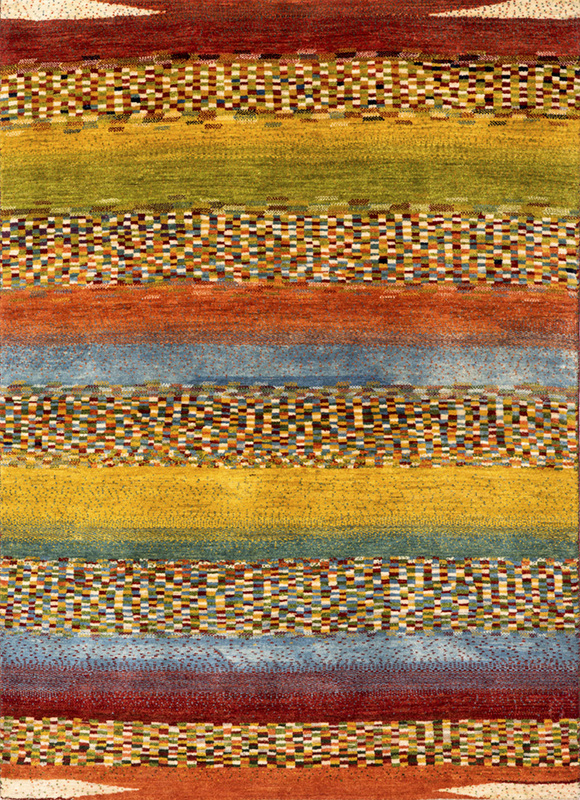 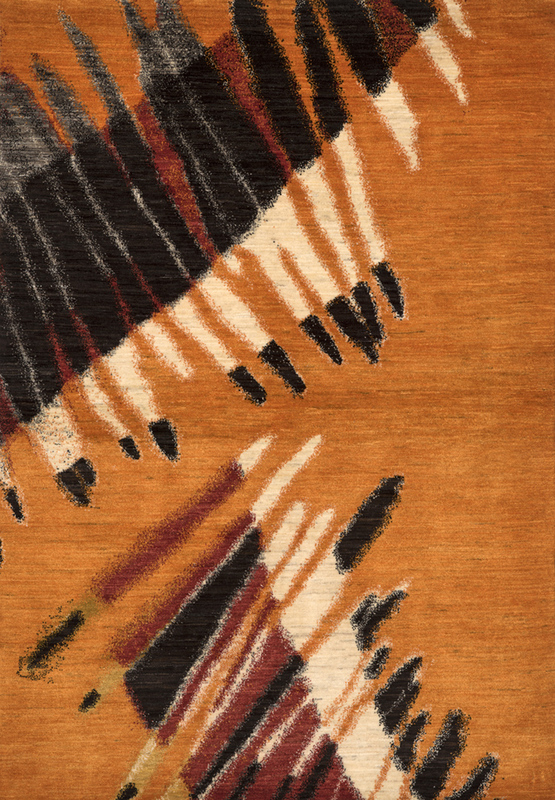 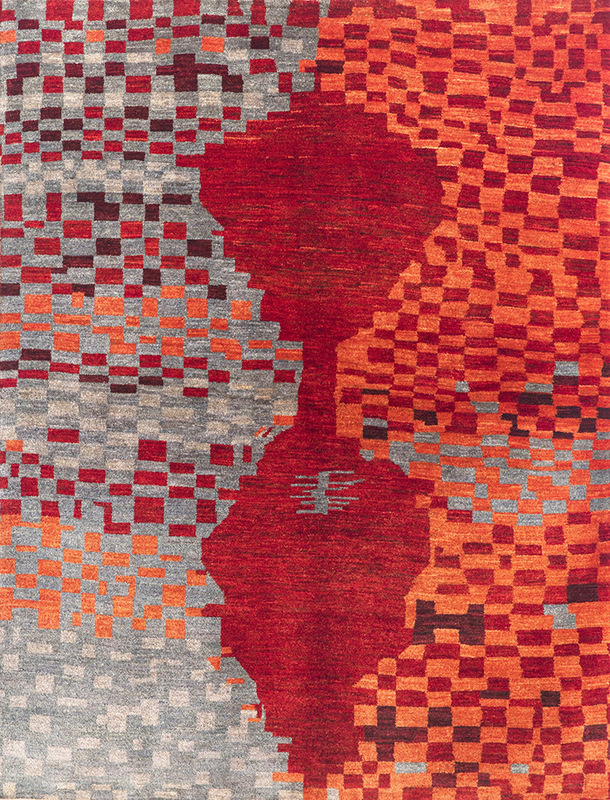 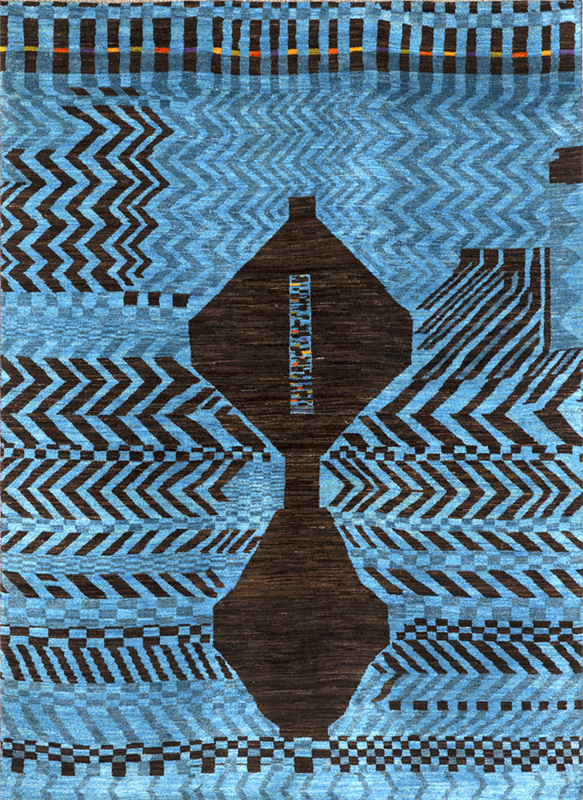 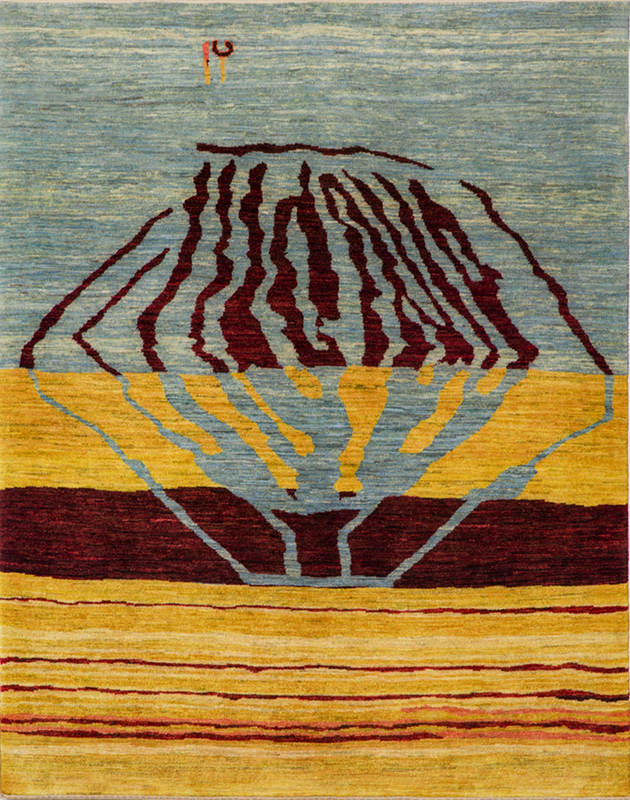 A Gabbeh is a hand-woven pile rug characterized by an abstract design that relies upon open fields of colour and playful geometry. 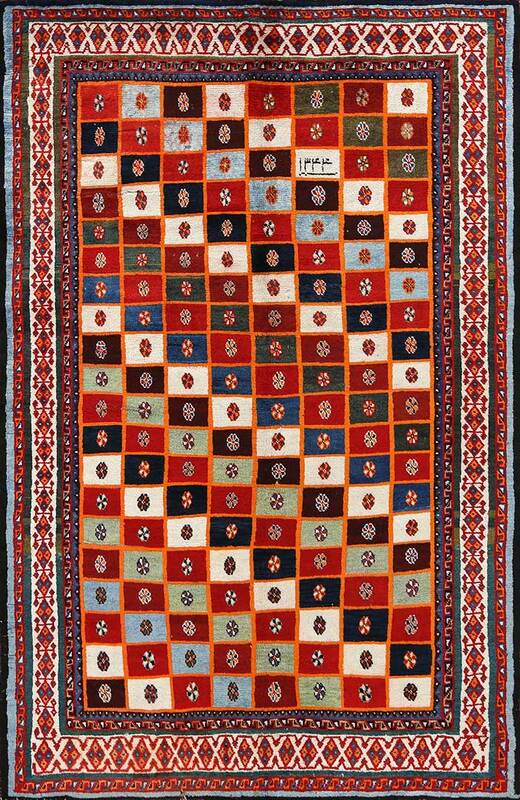 Gabbehs are woven by tribal women and are principally used as ‘bedding blankets’ by the nomadic tribes of the Zagros Mountains of Iran, including Kurdish, Luri and Ghashgha’i people. 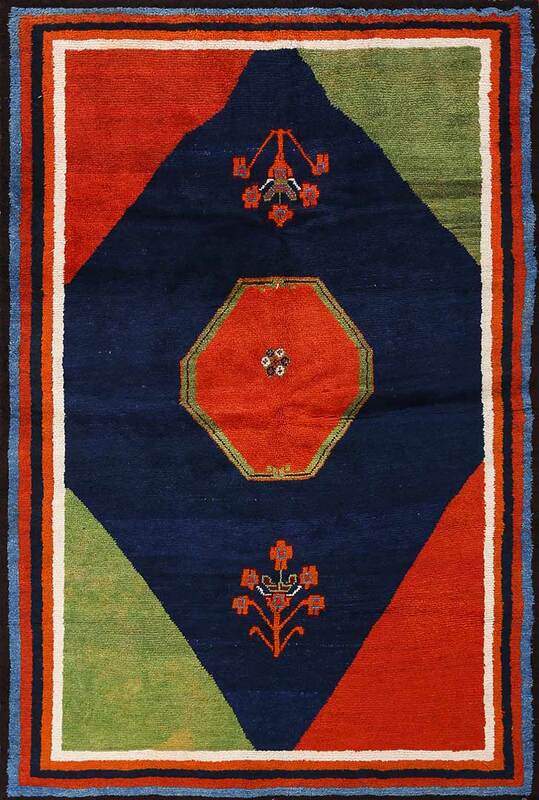 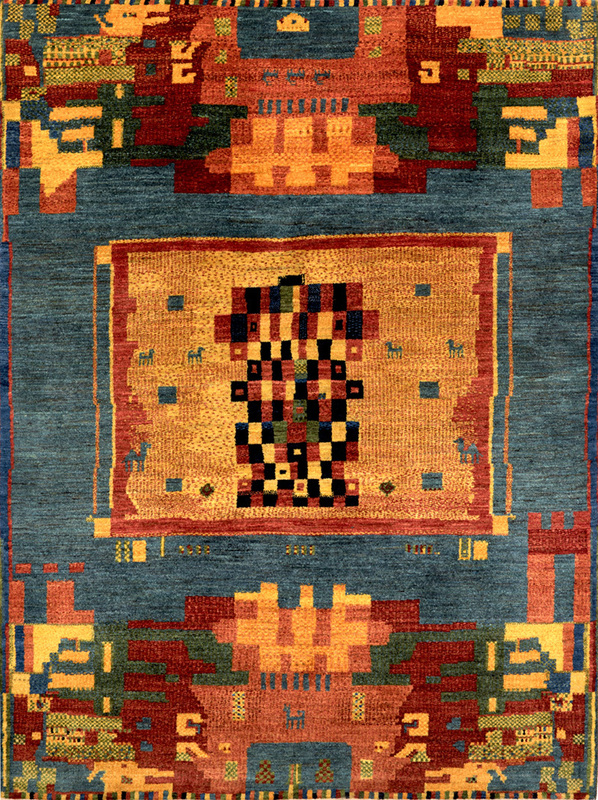 Gabbehs are quintessentially Zollanvari and geometric designs are quintessential Gabbeh designs. 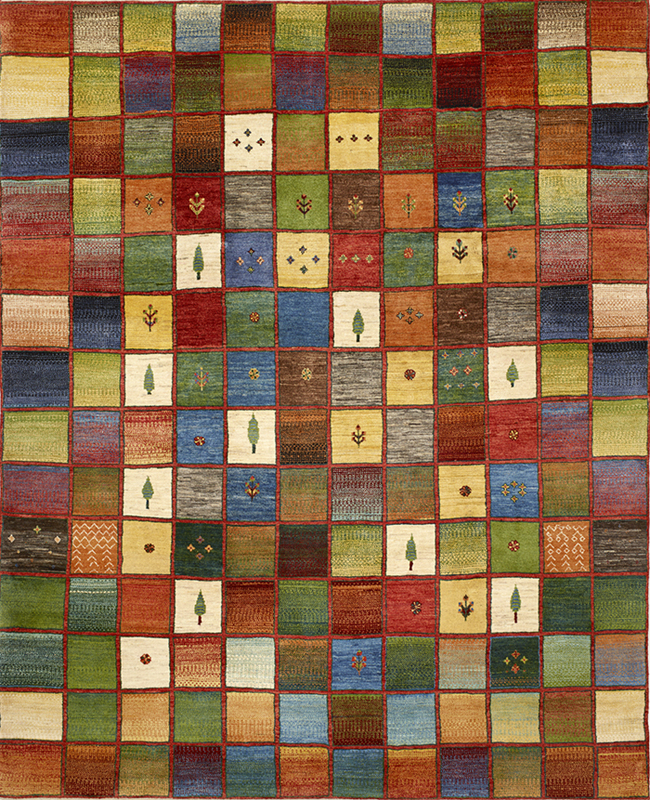 Our Gabbehs come in different qualities. 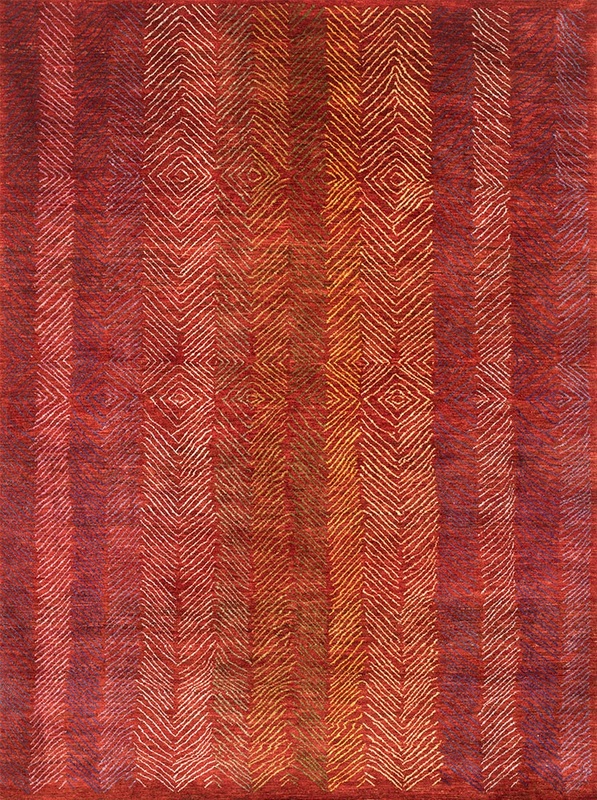 Our finest Gabbeh weave is Kashkuli, named after one of the Ghashgha’i nomadic tribes living in Fars province, southeast and northwest of Shiraz. 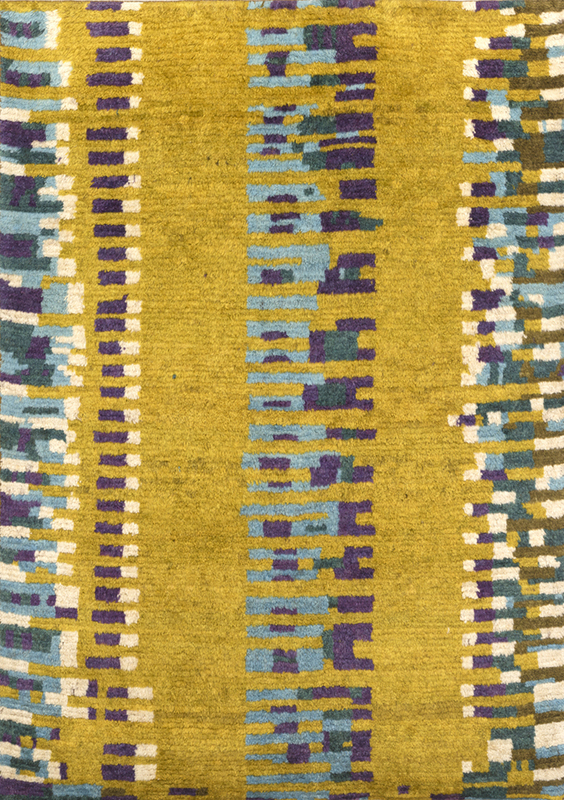 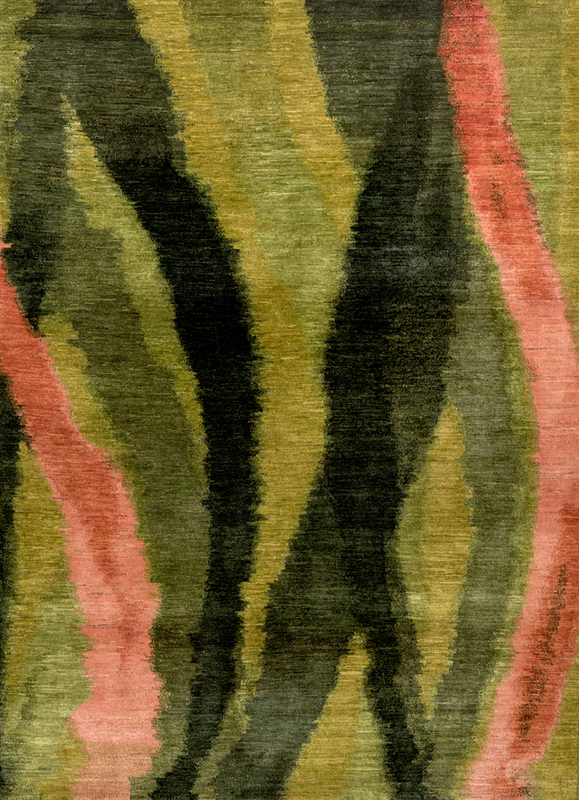 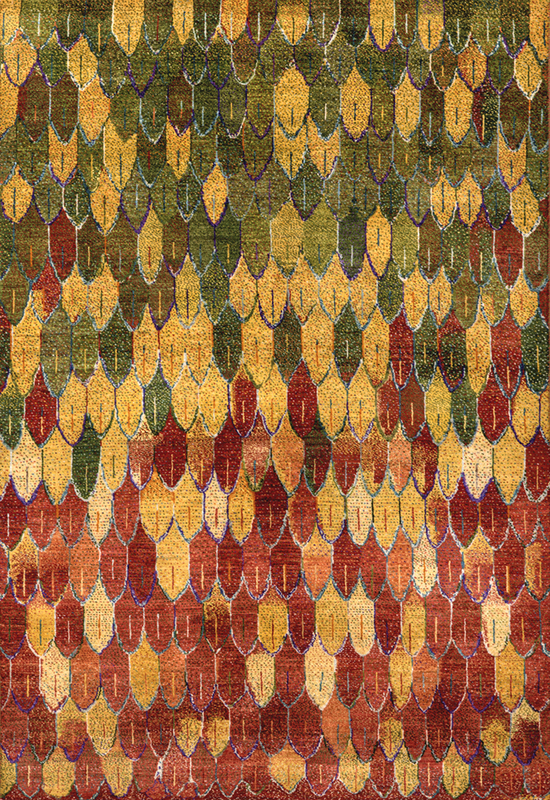 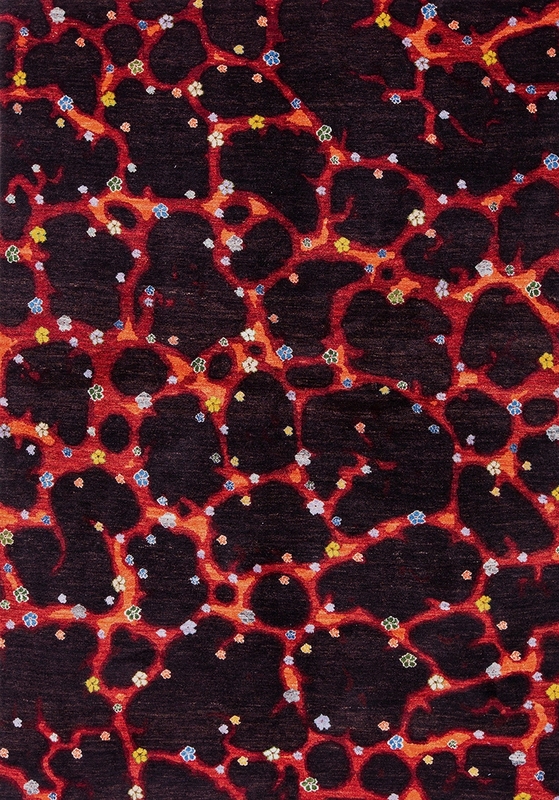 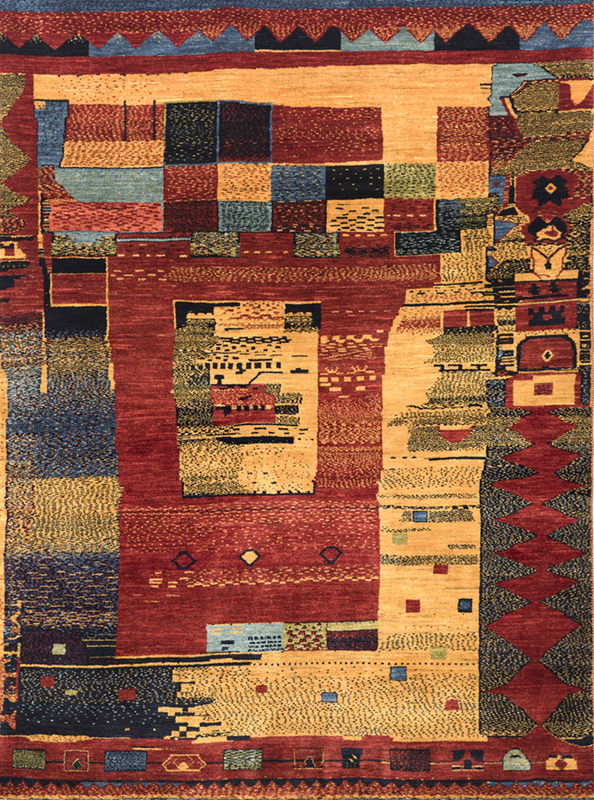 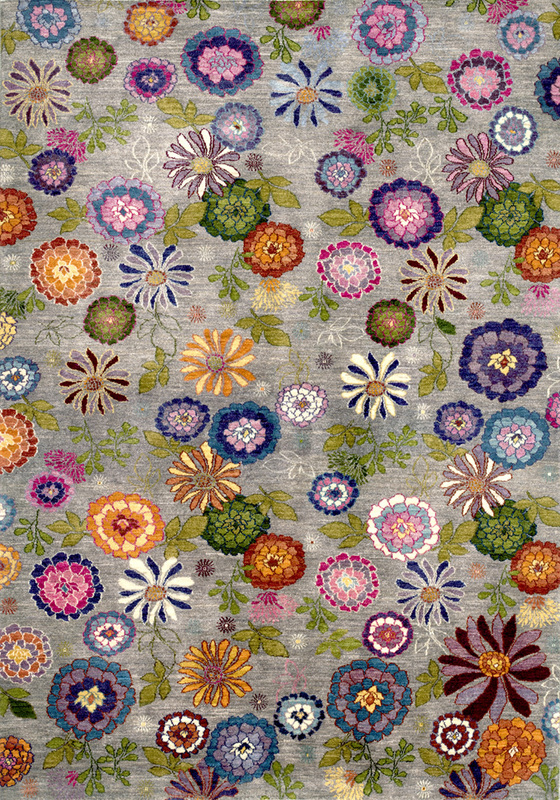 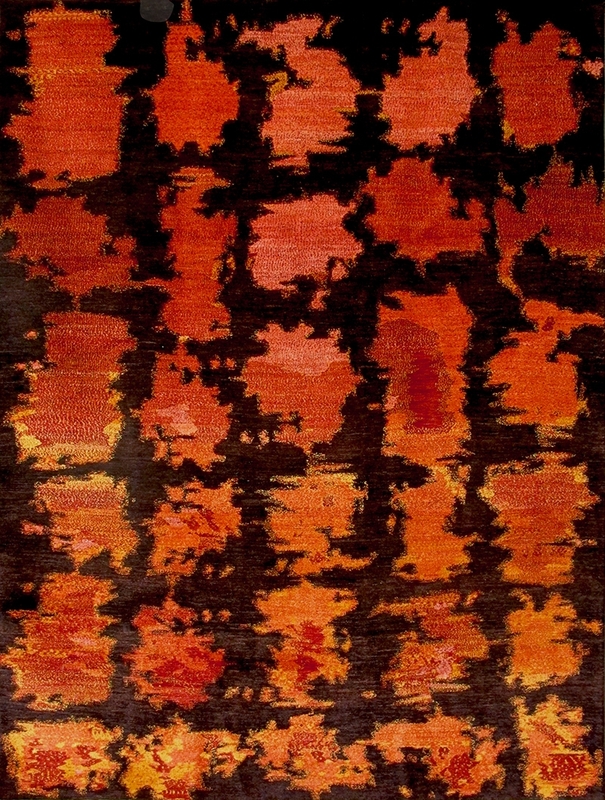 Amaleh, also named after one of the Ghashgha’i tribes who produced high quality artefacts for the Khans, are more coarsely knotted, but truly unique and individual in patterns and colour combinations. 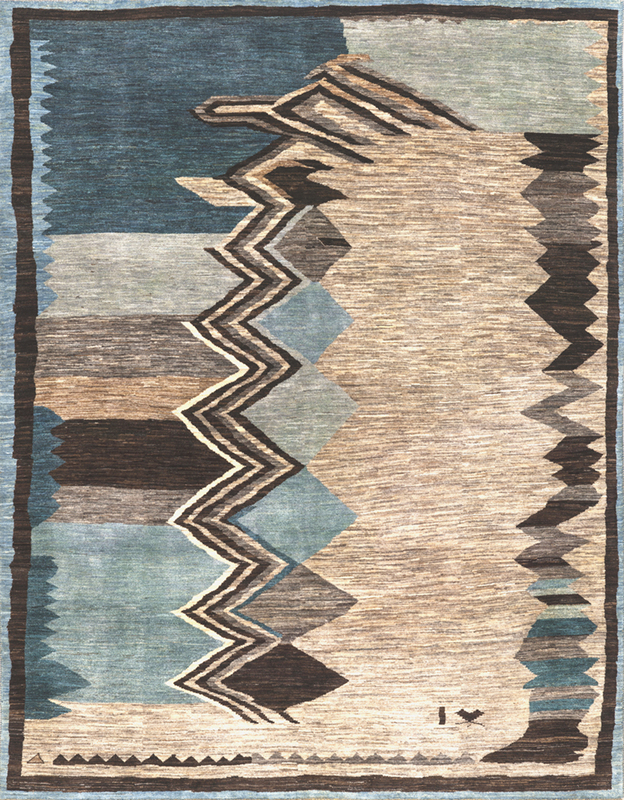 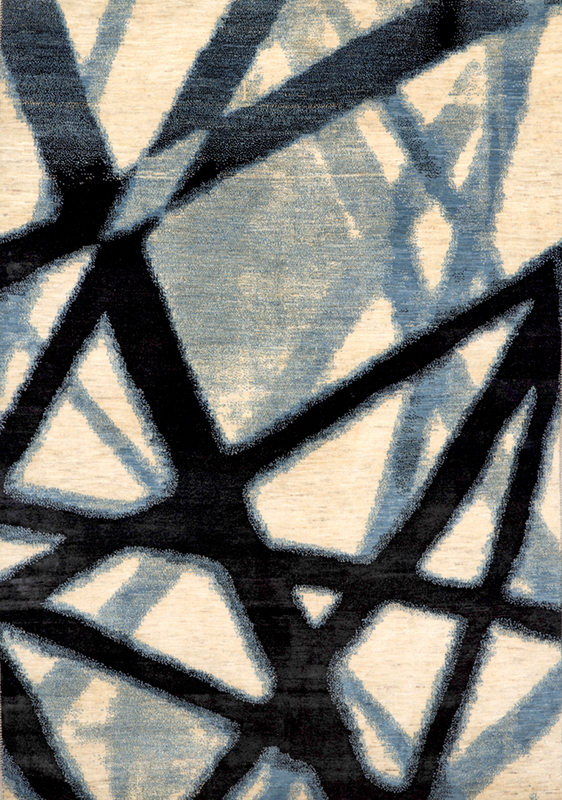 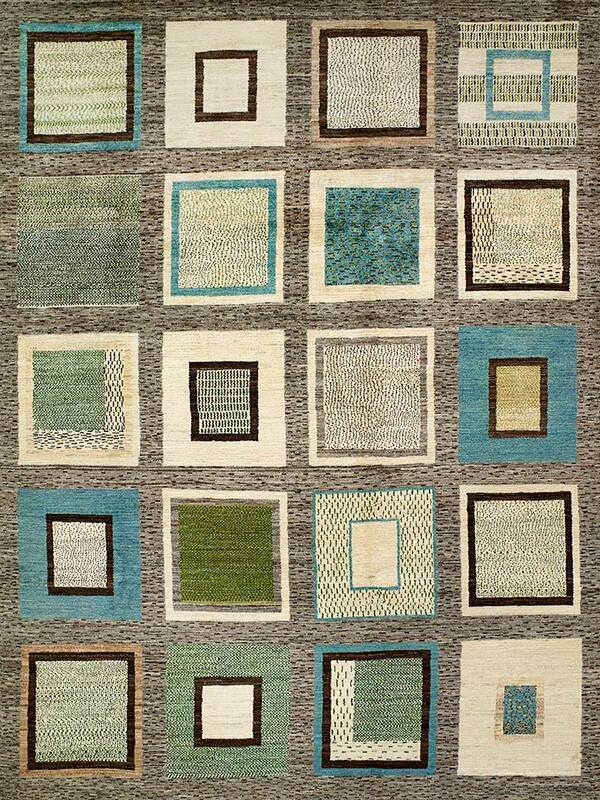 Abstract designs are Gabbeh classics. 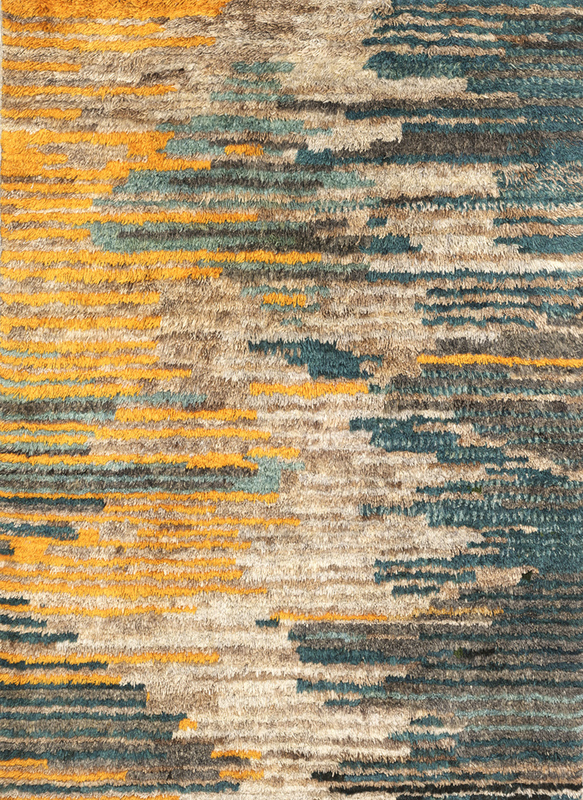 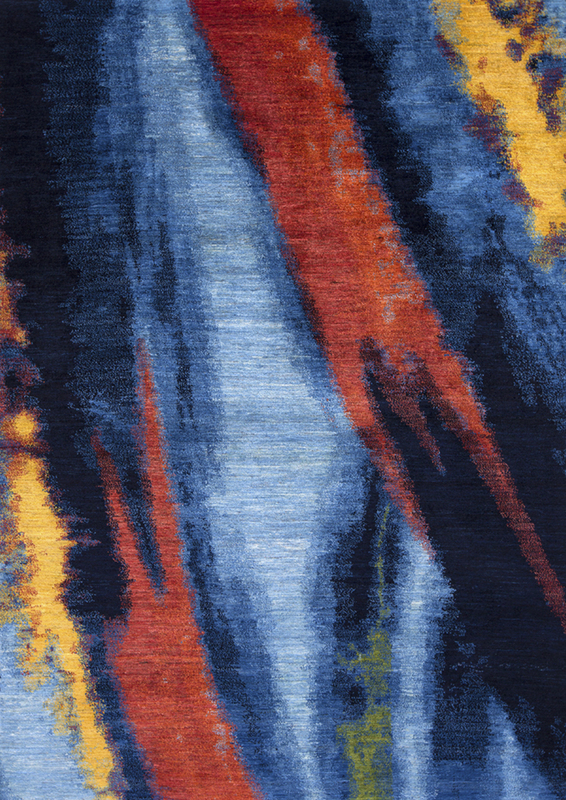 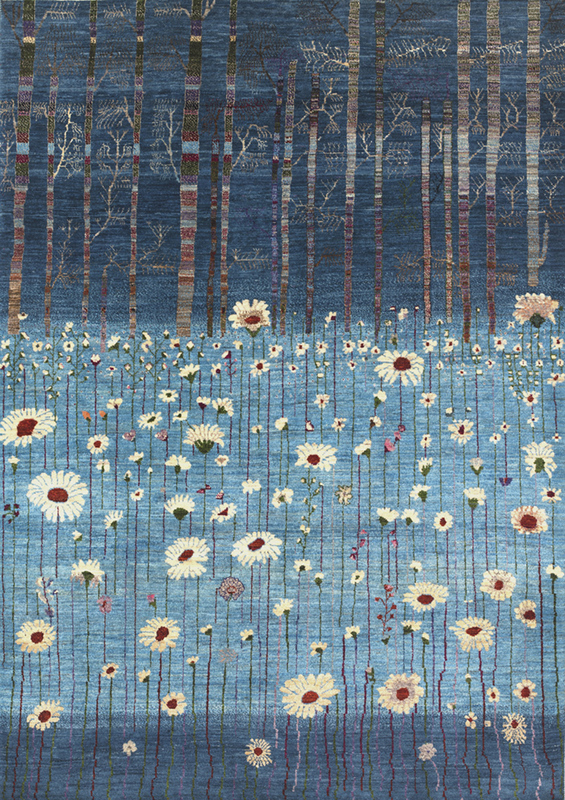 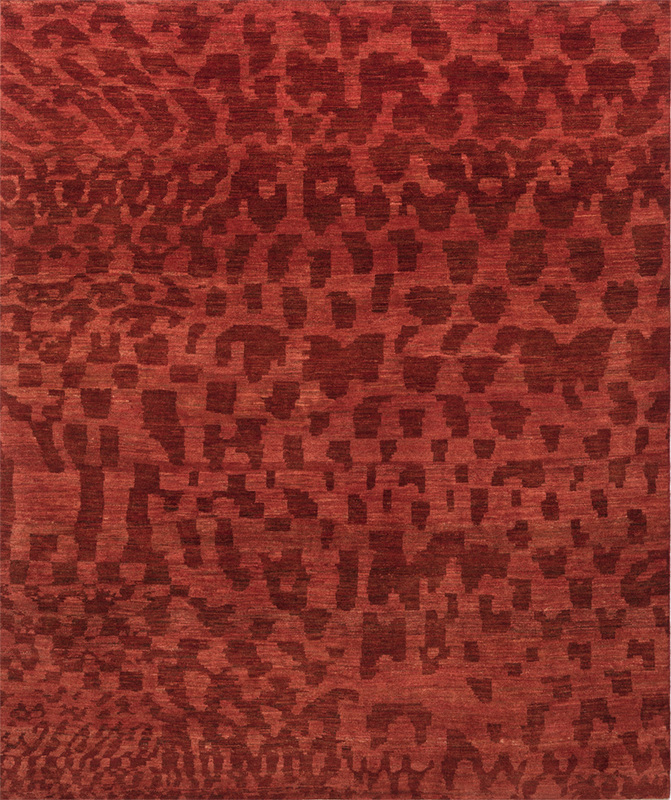 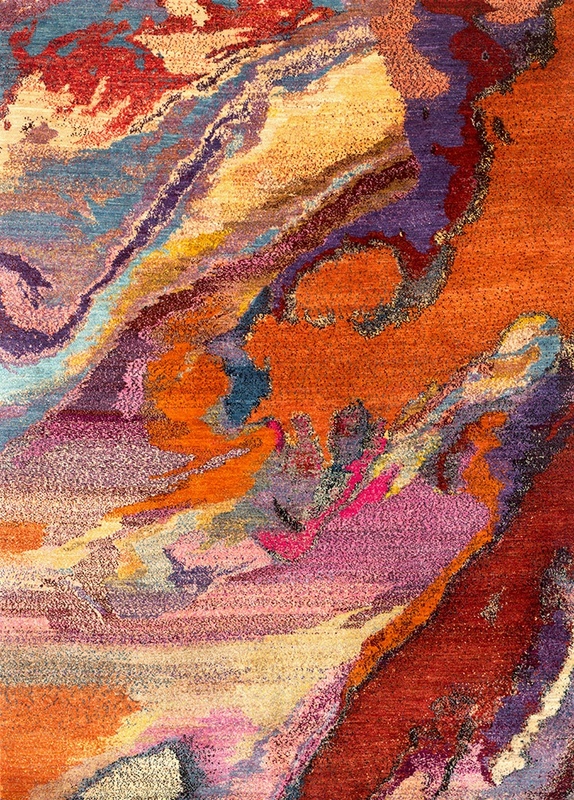 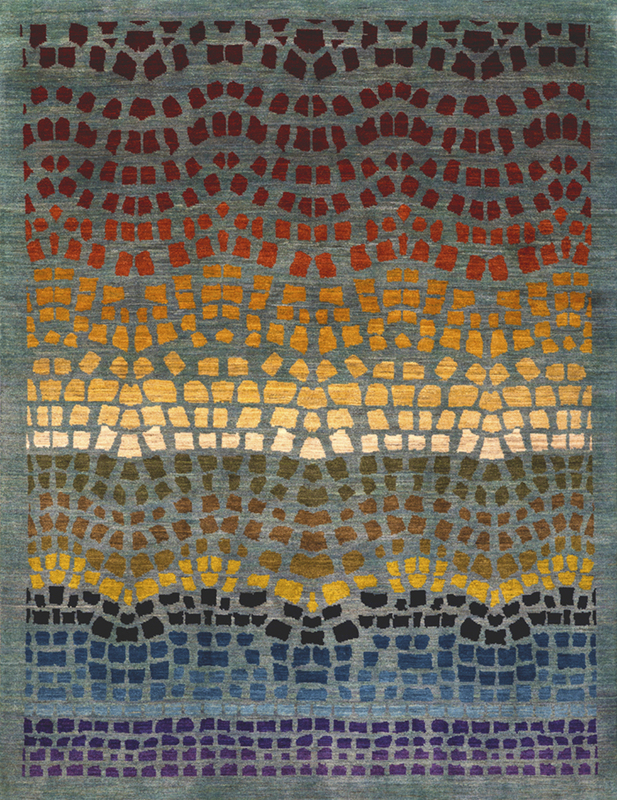 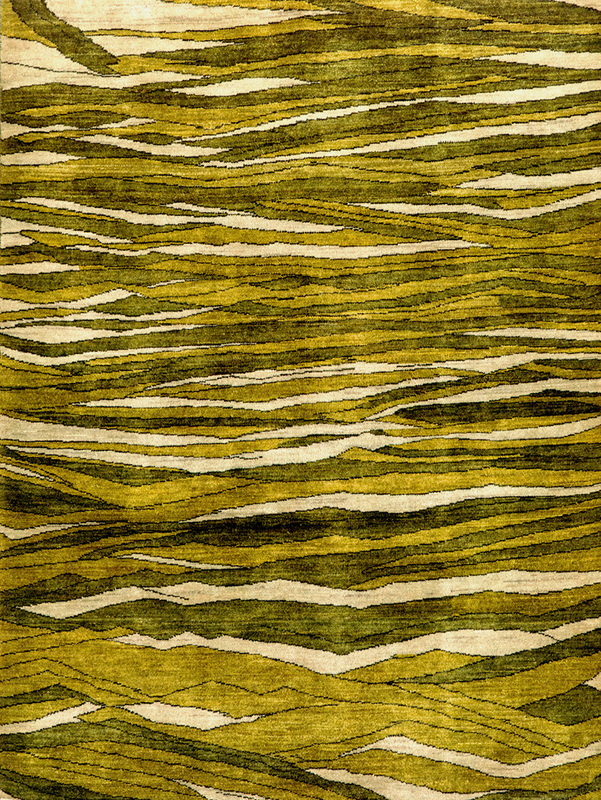 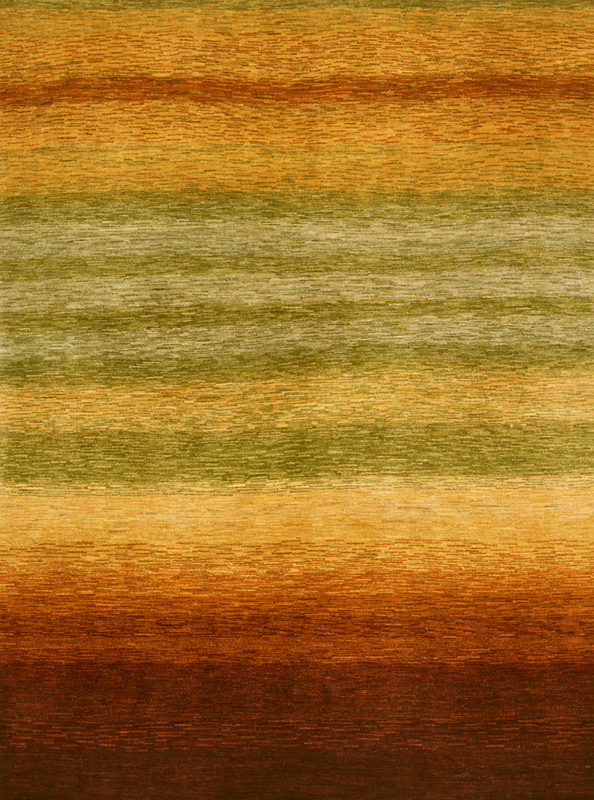 Zollanvari have produced modern versions of these classics that have won recognition worldwide, including various Carpet Design Awards at DOMOTEX: ‘Broken Waves’ was named Best Modern Design in 2009 and ‘Mirage’ Best Modern Design Superior in 2010. 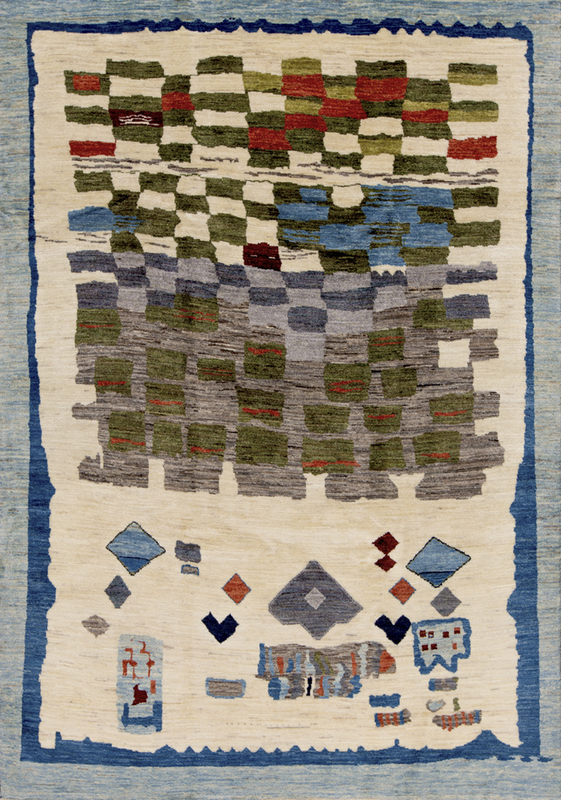 Abstract & Plain Gabbehs are available in both Amaleh and Kashkuli qualities. 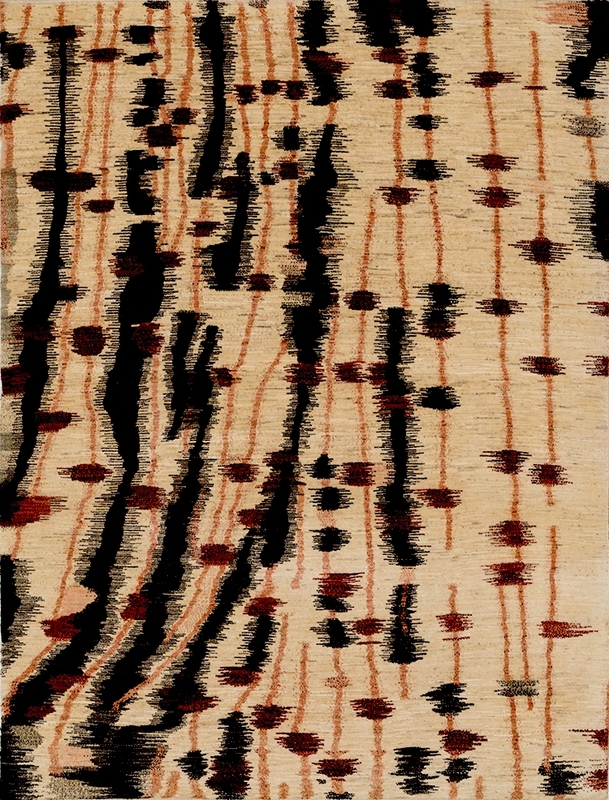 We also offer carpets in natural colours (undyed wool) and single colours with a mesmerizing abrash effect in our Shekarlou range, which is woven by Turkmen tribes in northern Iran. 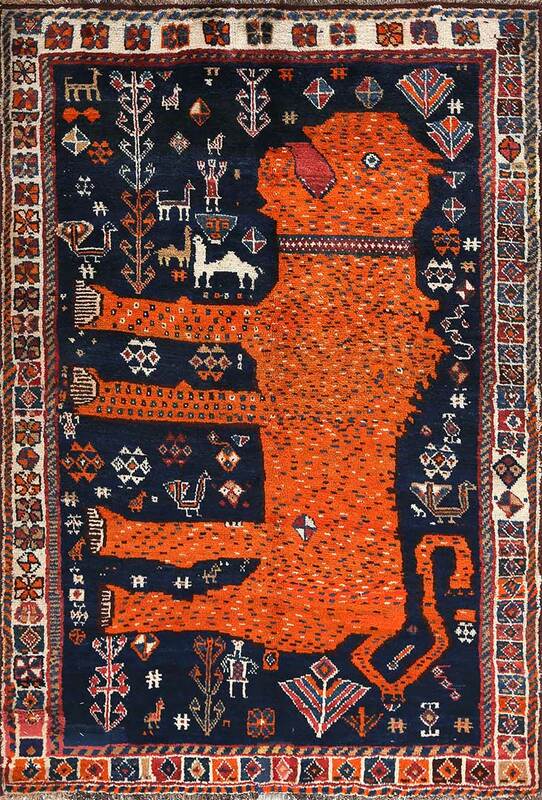 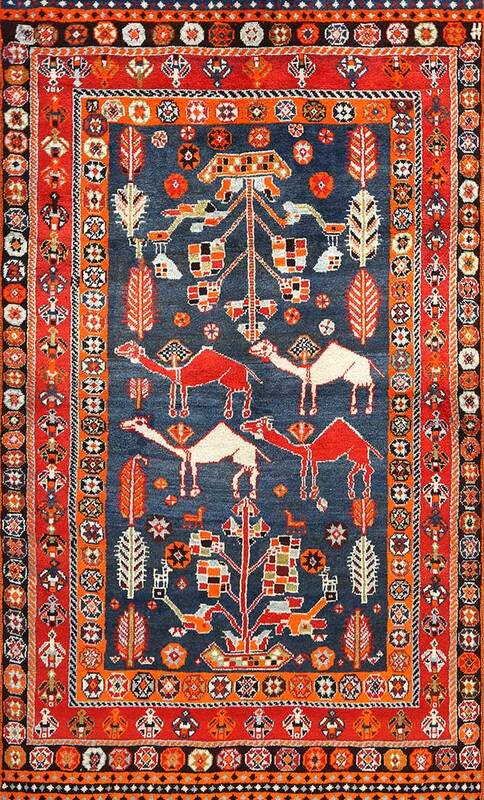 The Shekarlou carpets are lighter due to the use of a single weft between rows of knots. 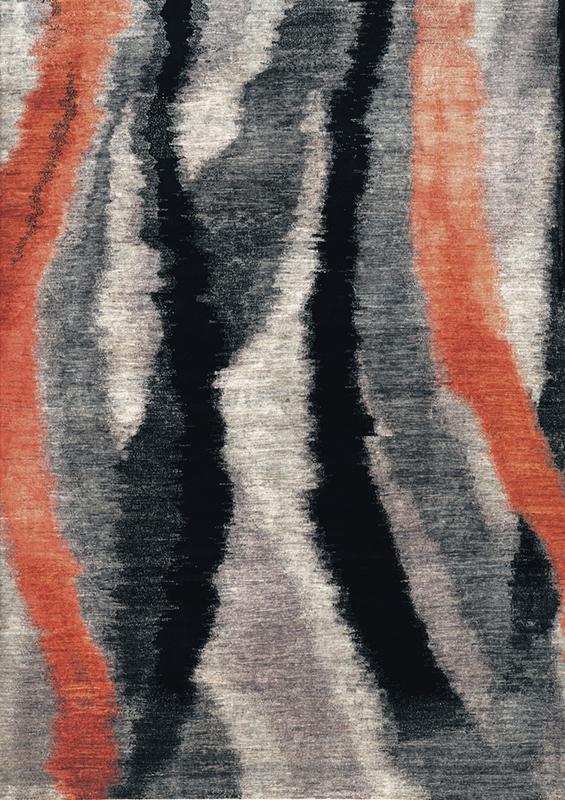 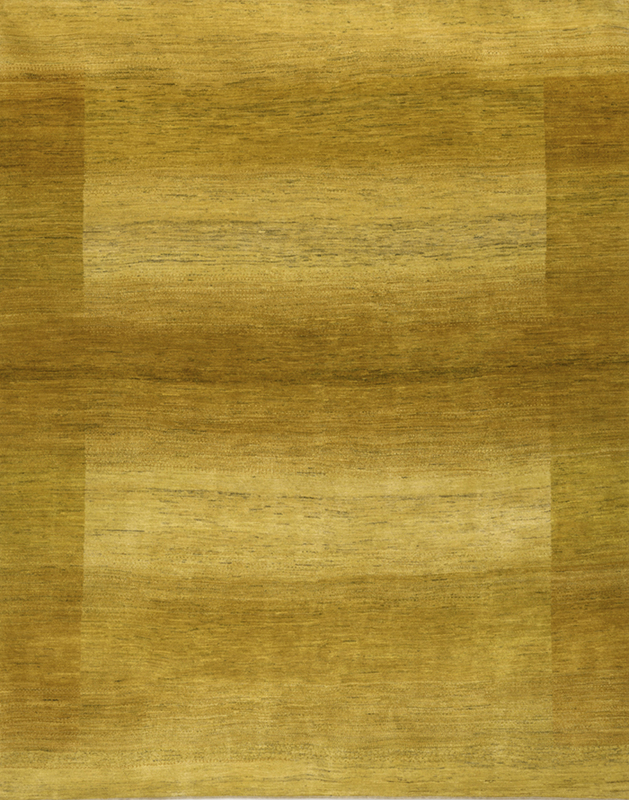 Geometric Brushstrokes 1, Modernist Gabbehs, Wool, 167 x 240cm. 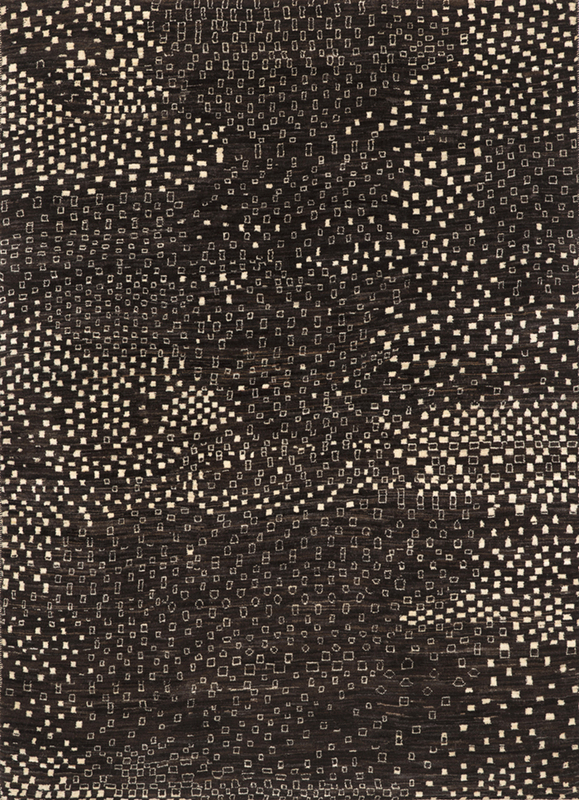 Stippled Brushstrokes 2a, Modernist Gabbehs, Wool, 170 x 240cm. 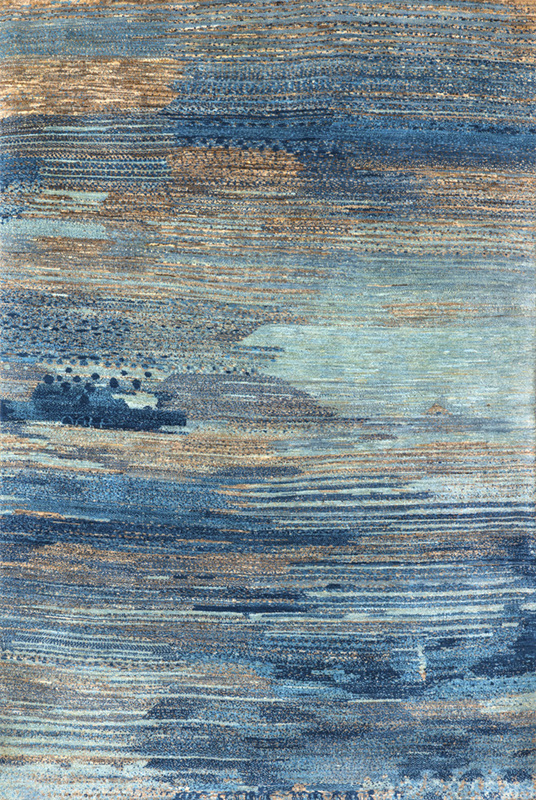 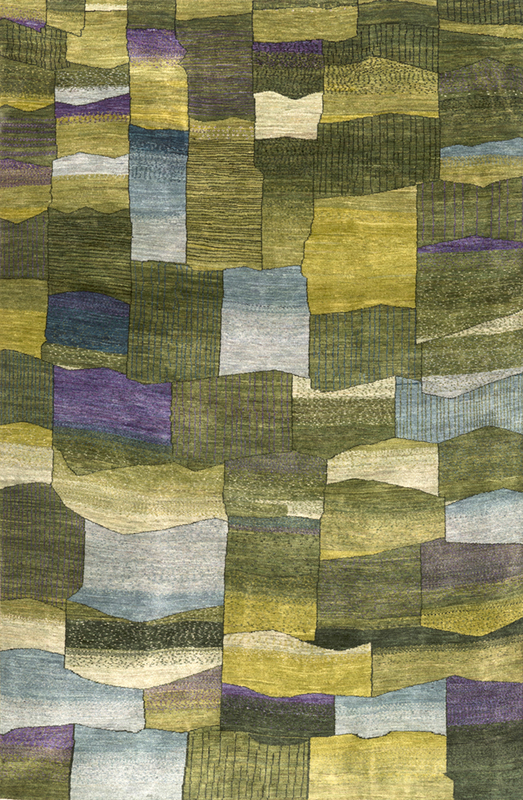 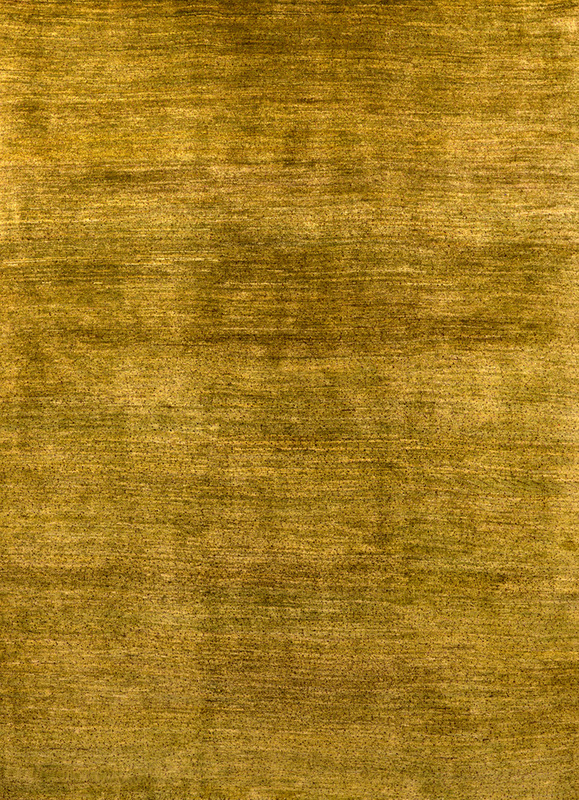 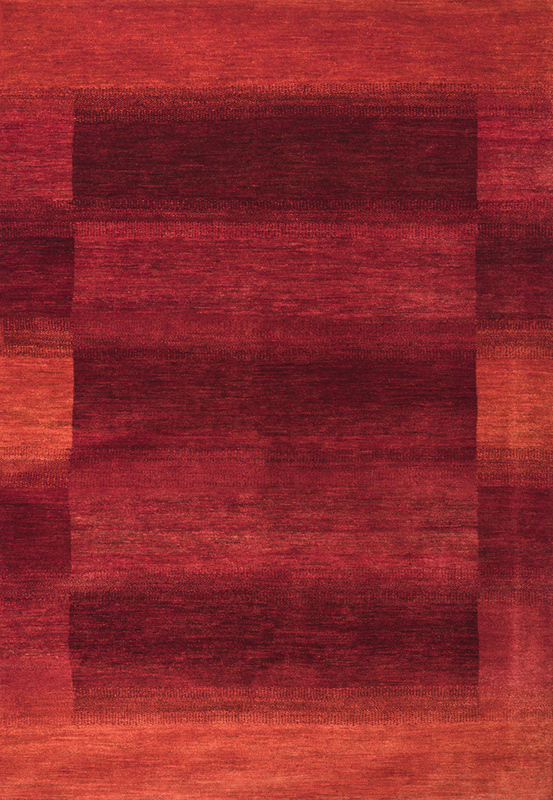 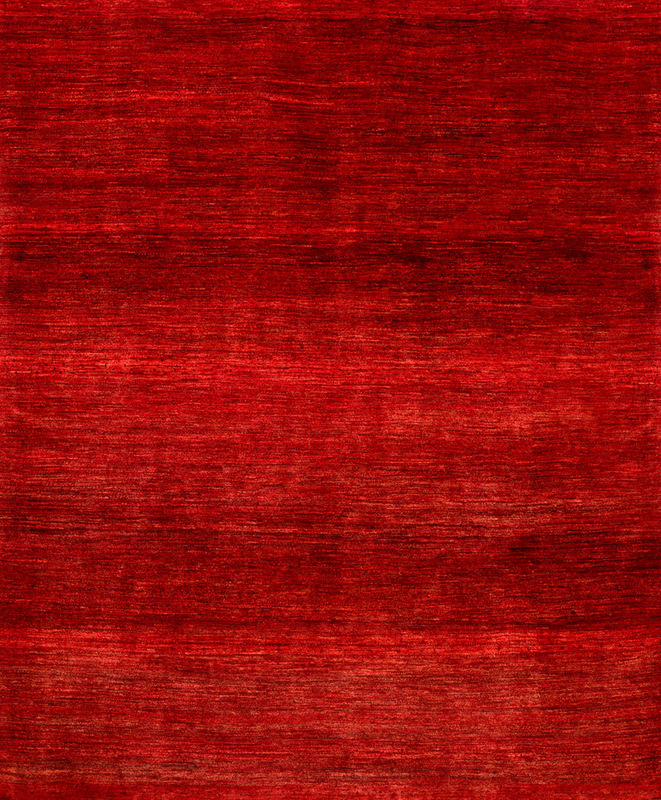 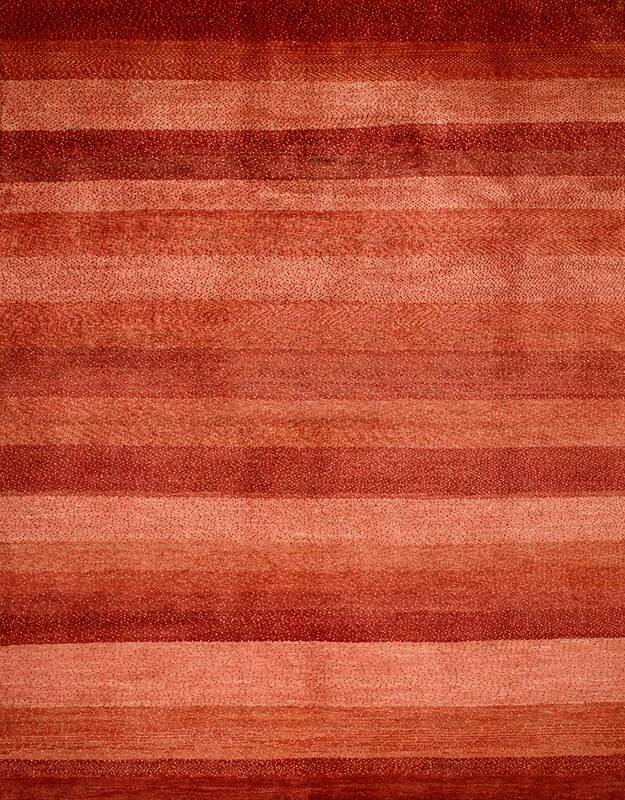 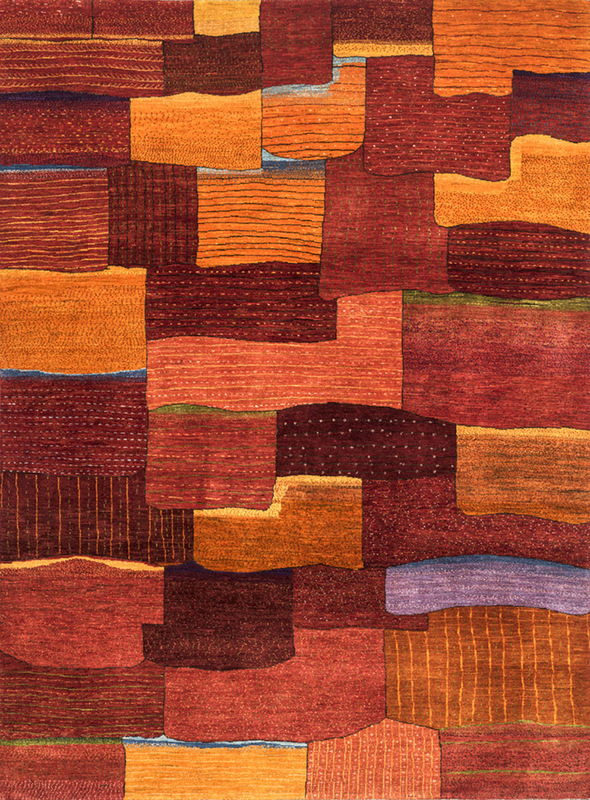 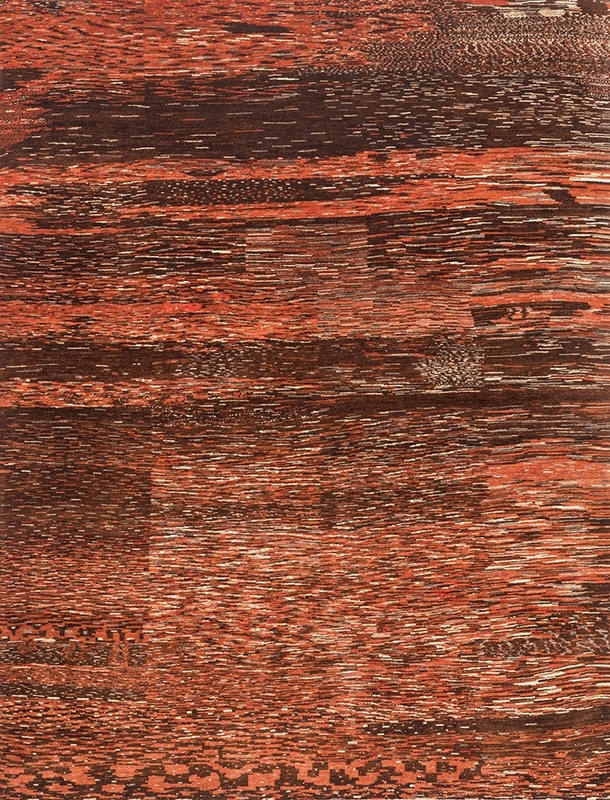 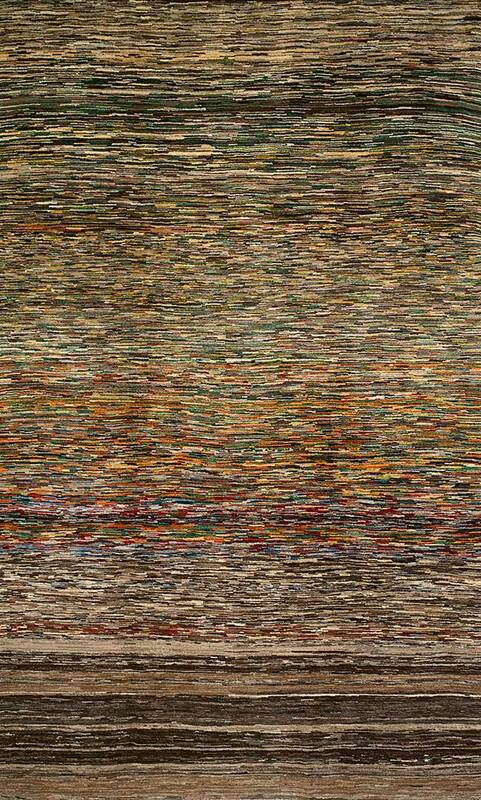 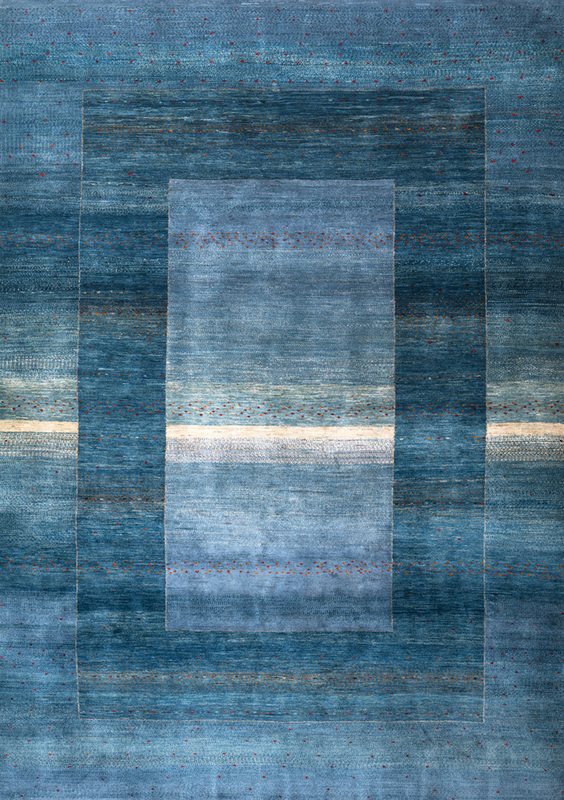 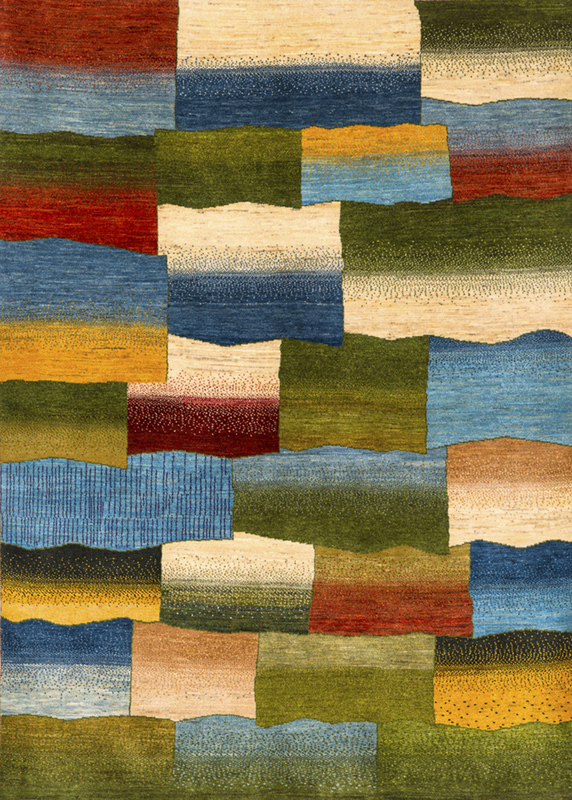 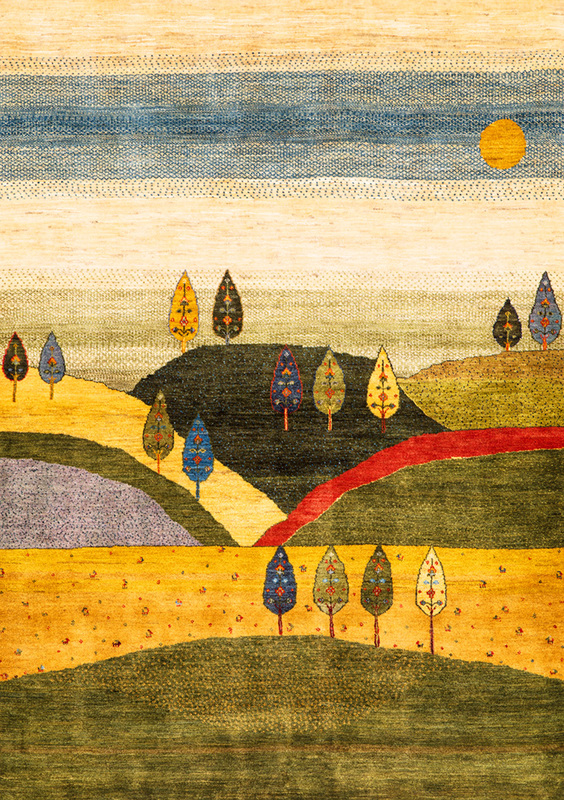 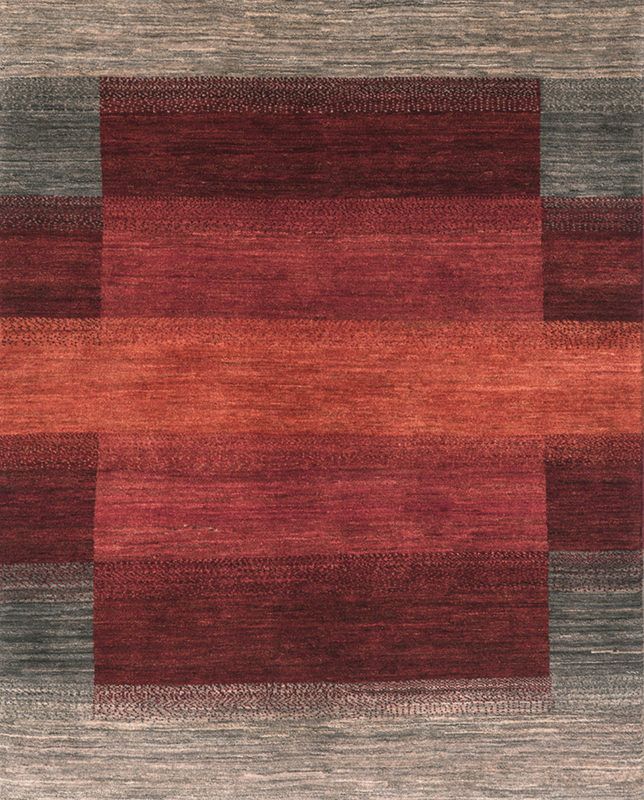 Stippled Brushstrokes 3, Modernist Gabbehs, Wool, 178 x 236cm. 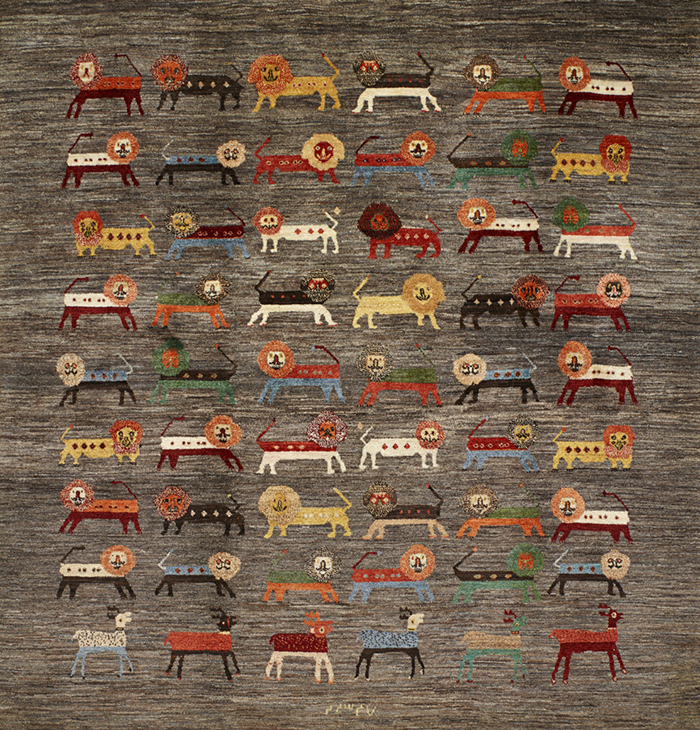 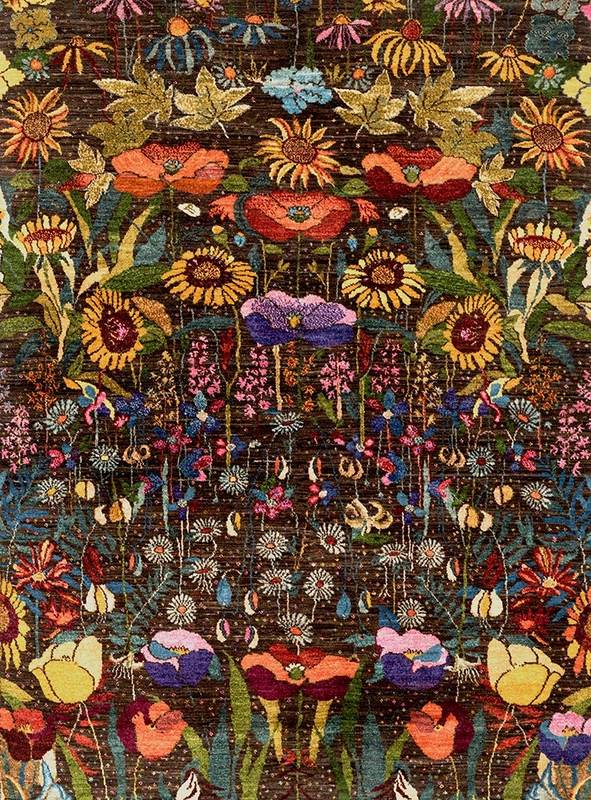 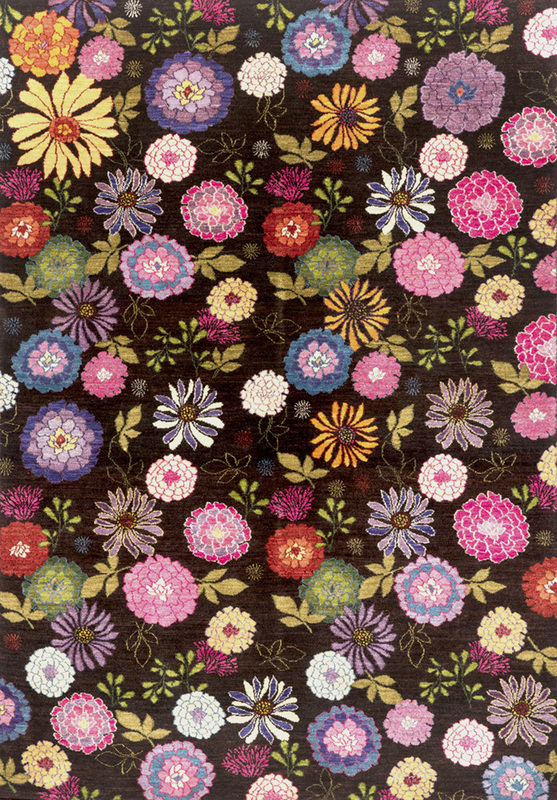 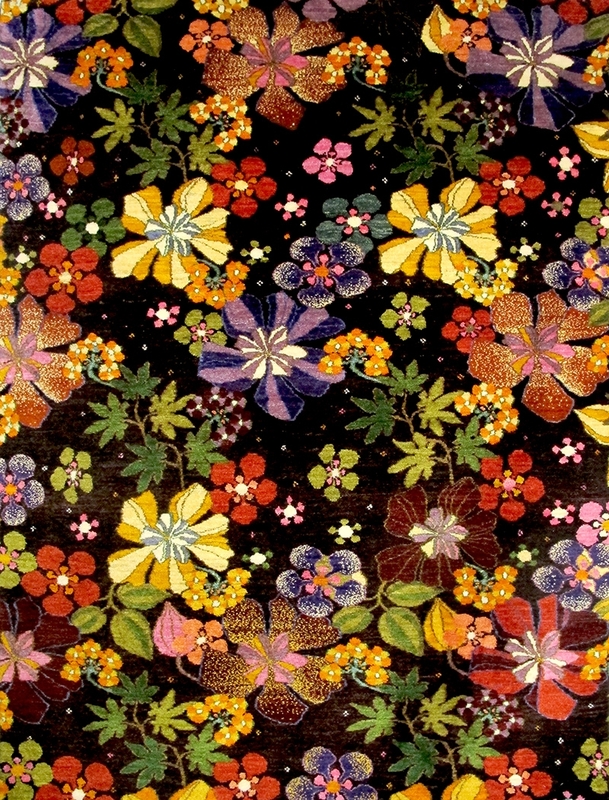 Trees, flowers and animals (principally lions) are design themes that are used by tribal women to weave some of Zollanvari’s most original Gabbehs. 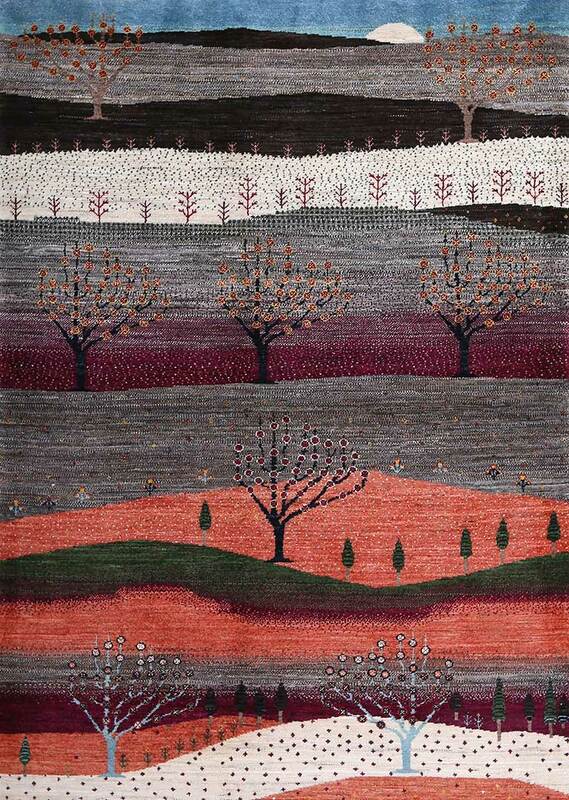 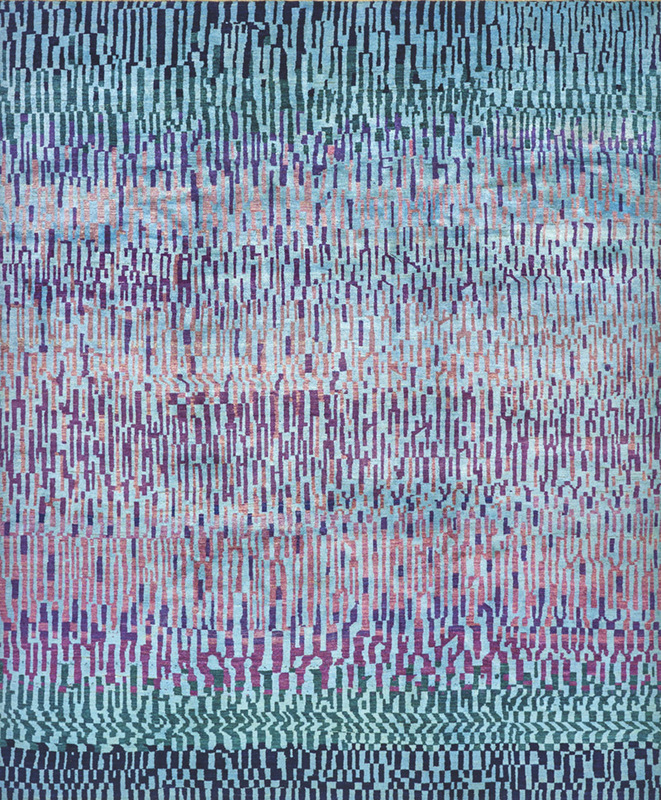 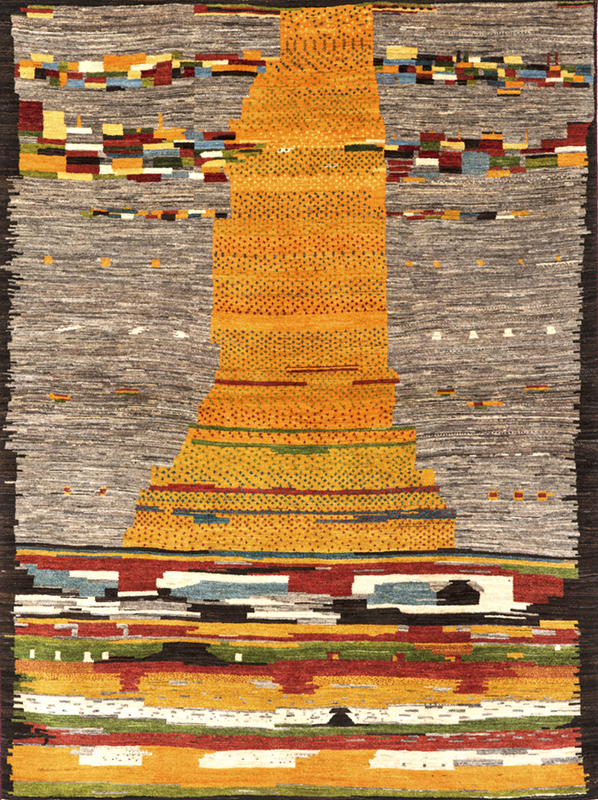 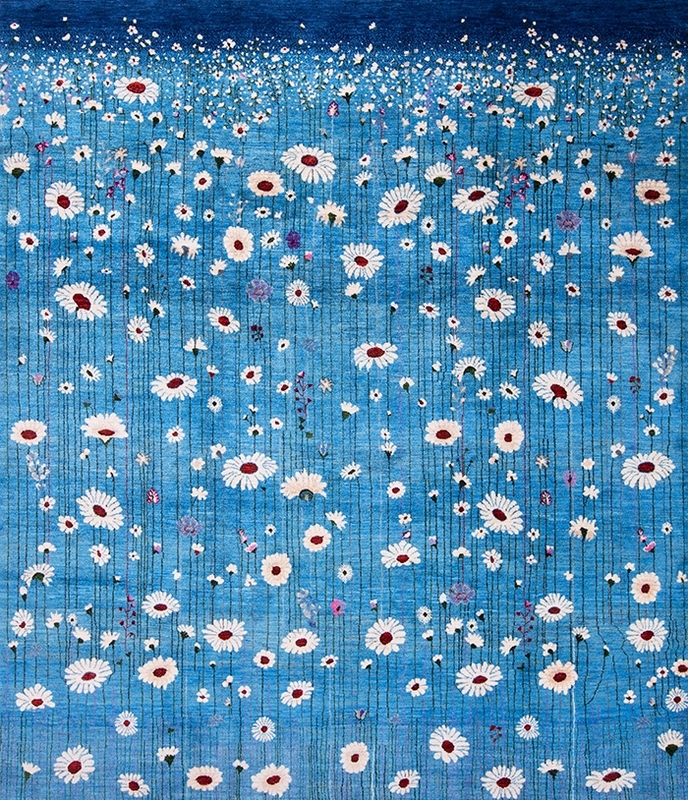 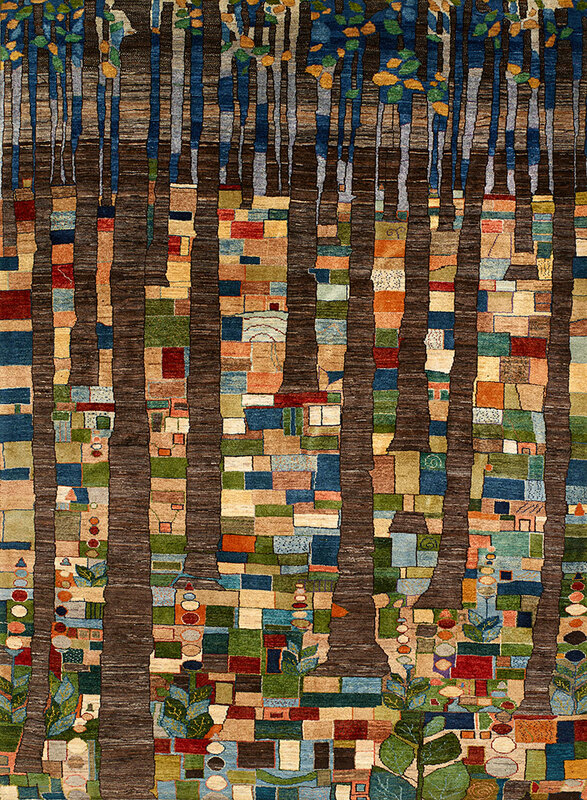 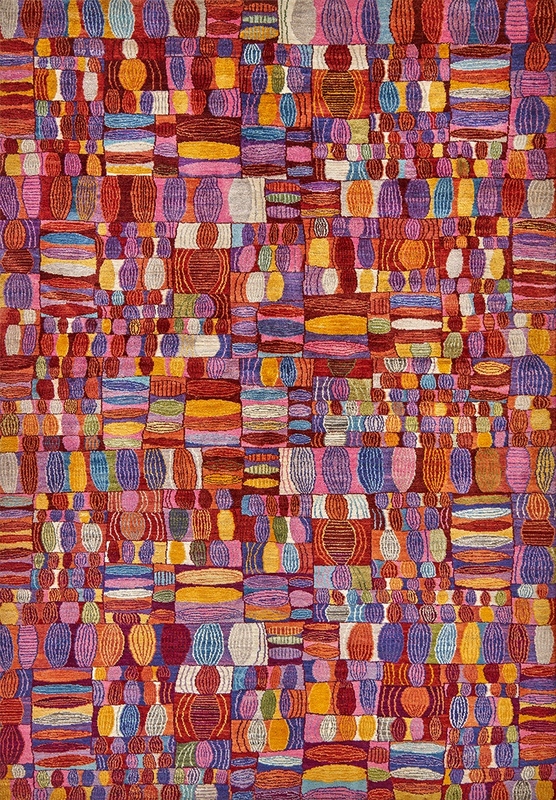 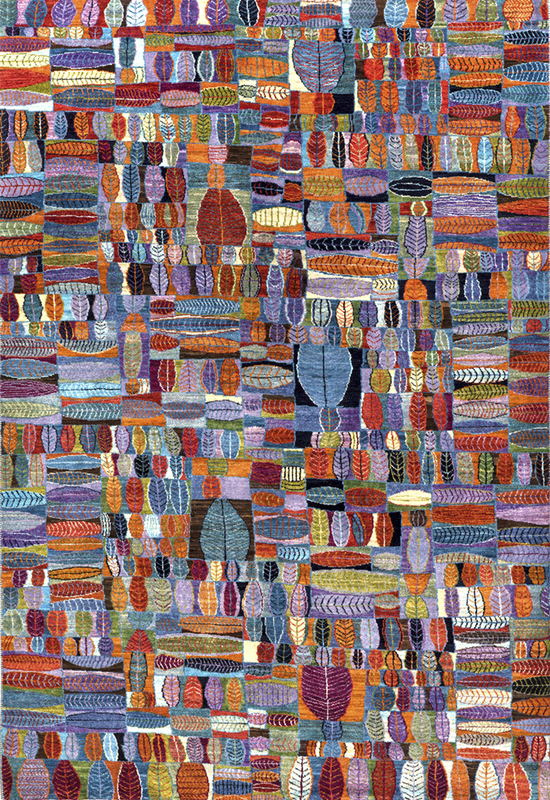 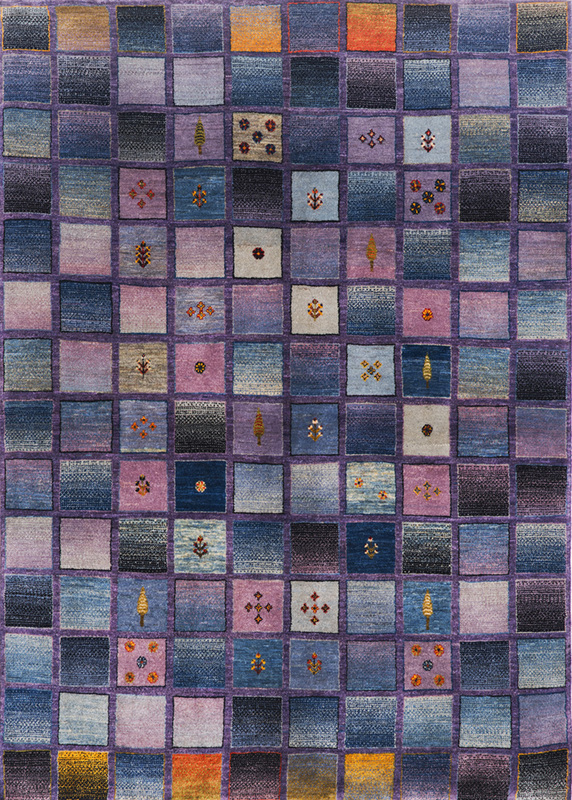 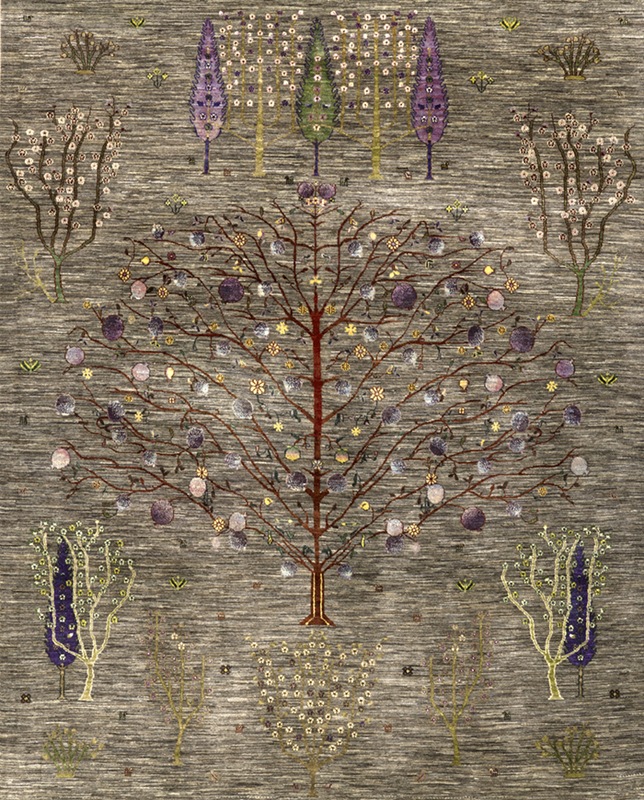 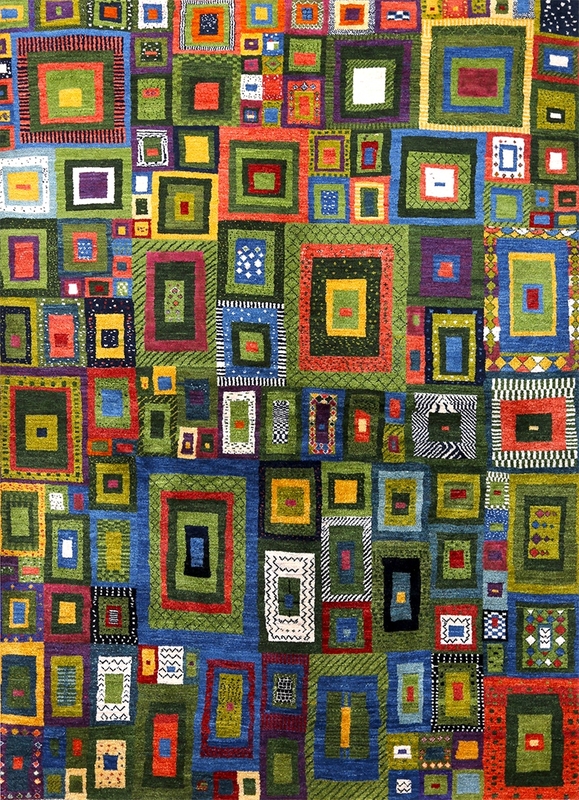 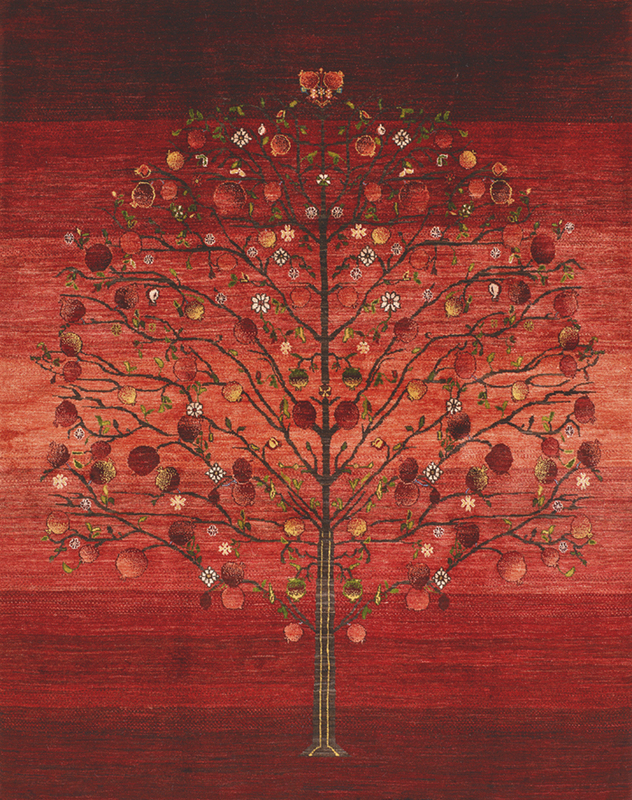 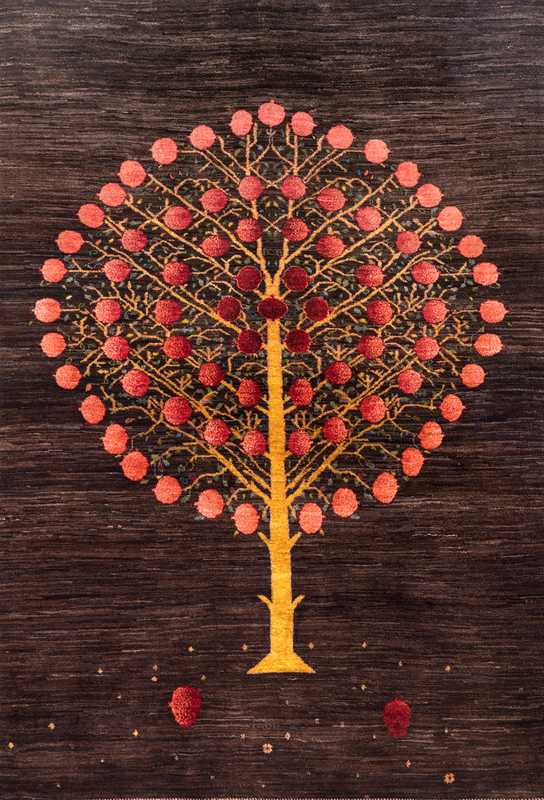 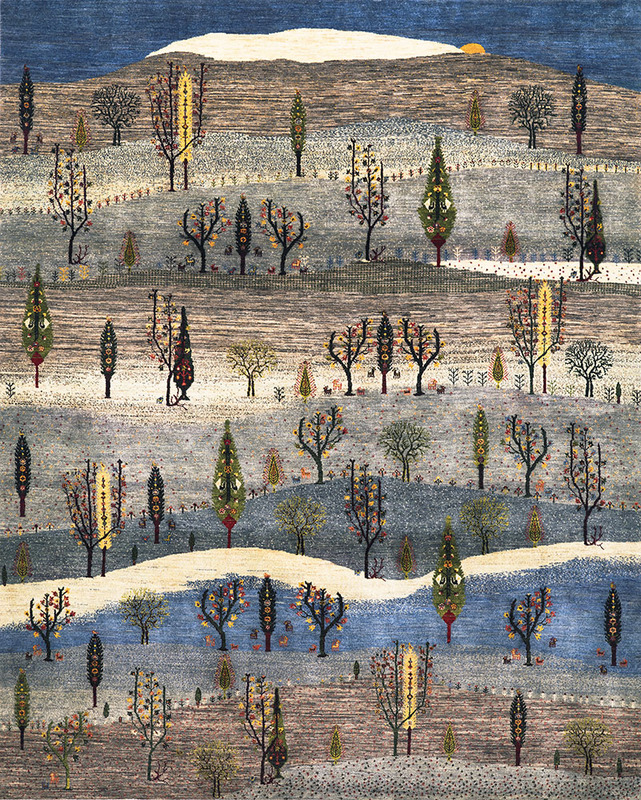 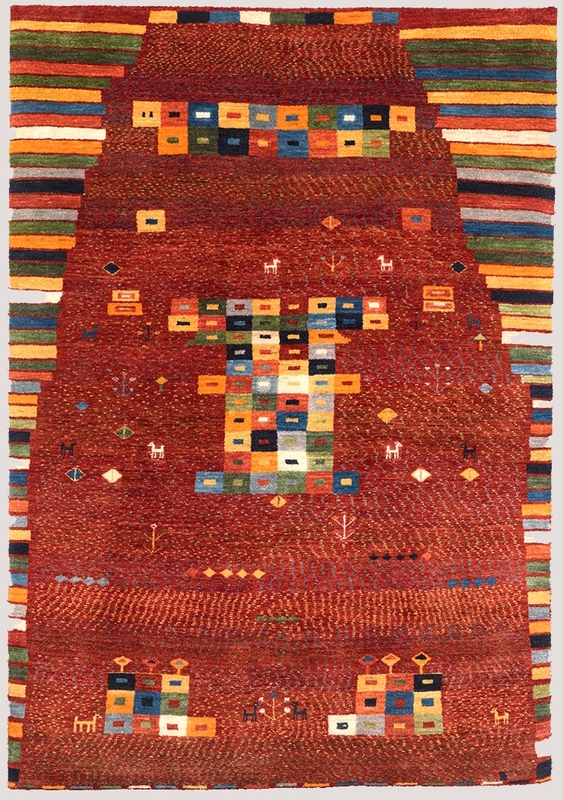 The weavers are given patterns and colour ranges (often inspired by ancient and archaic patterns such as the ‘Tree of Life’) but have a free hand in producing these works of woven art using their imaginations and the traditional design vocabulary passed down through each new generation of weavers. 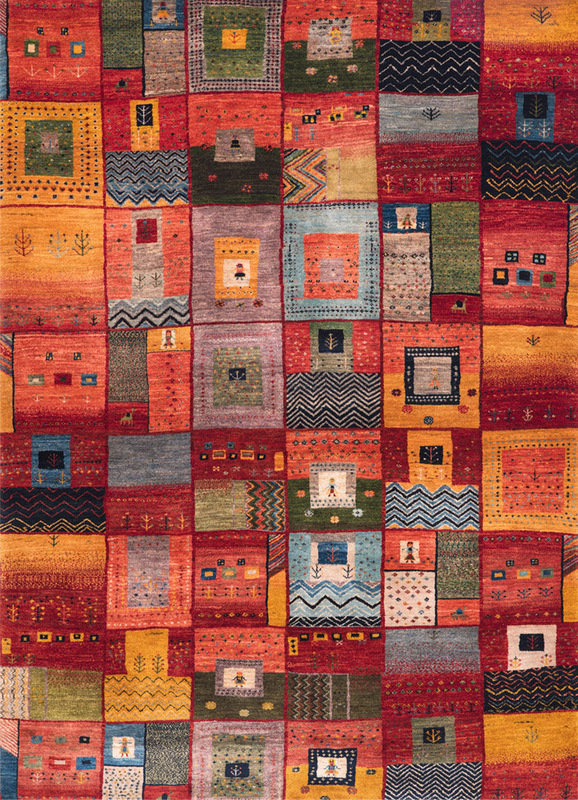 This makes each Gabbeh unique and individual. 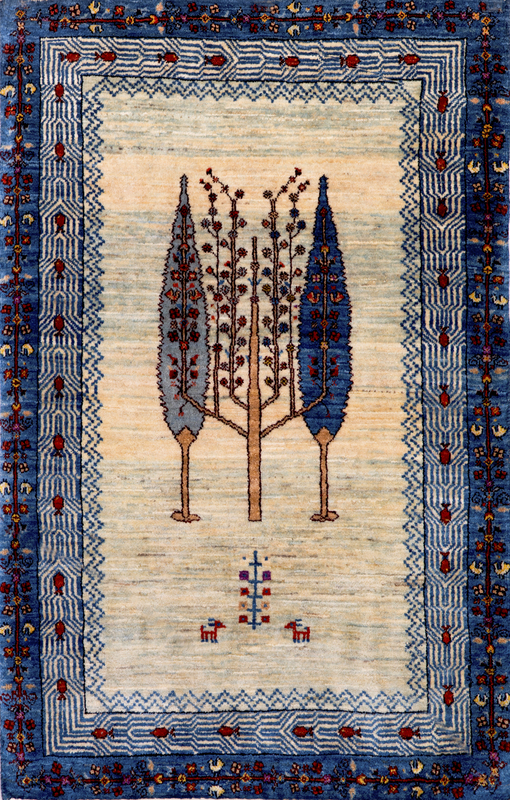 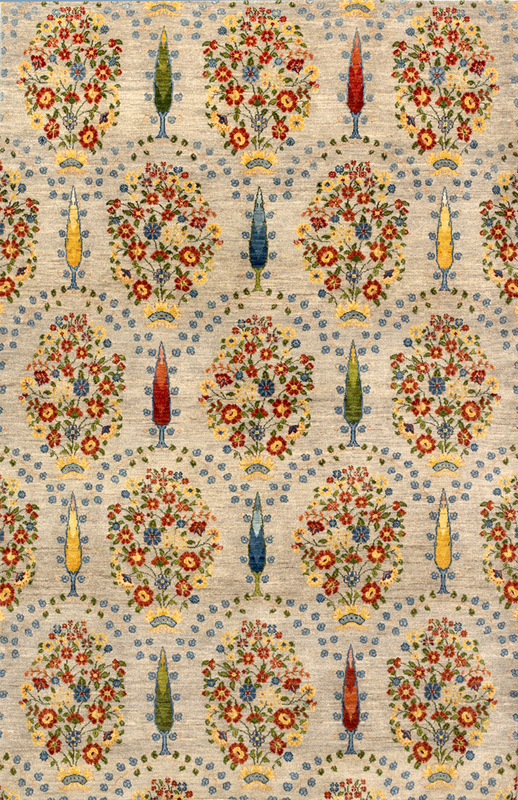 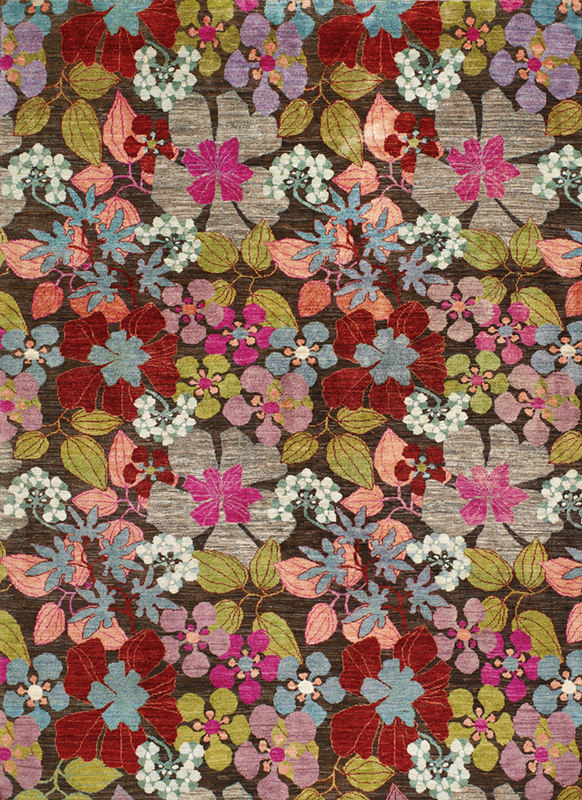 Flora & Fauna design Gabbehs are also available in Amaleh and Kashkuli qualities, as well as Luribaft and Bulurbaft. 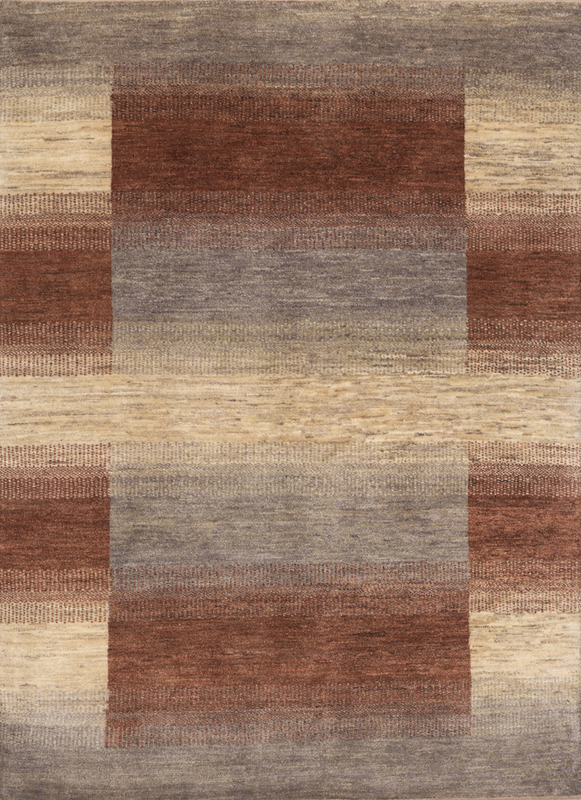 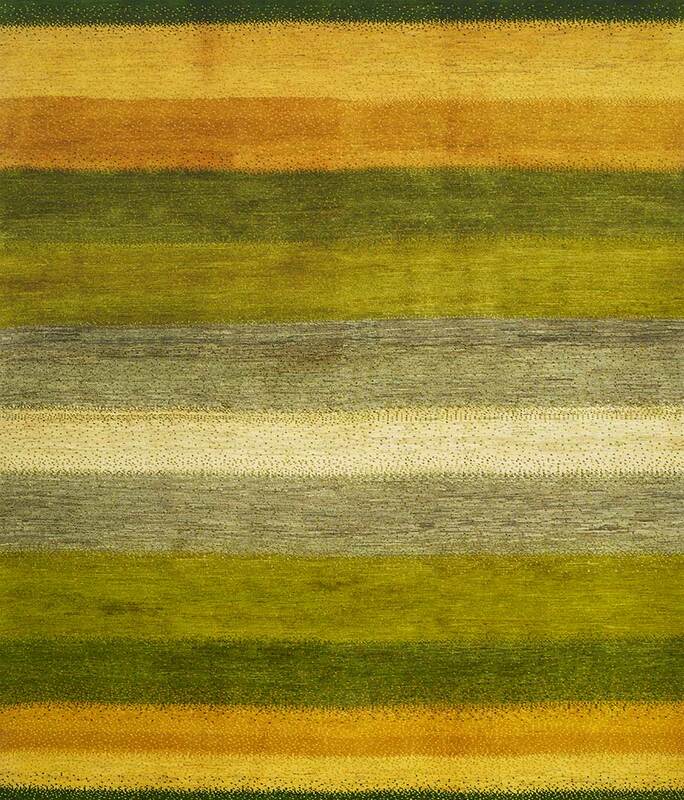 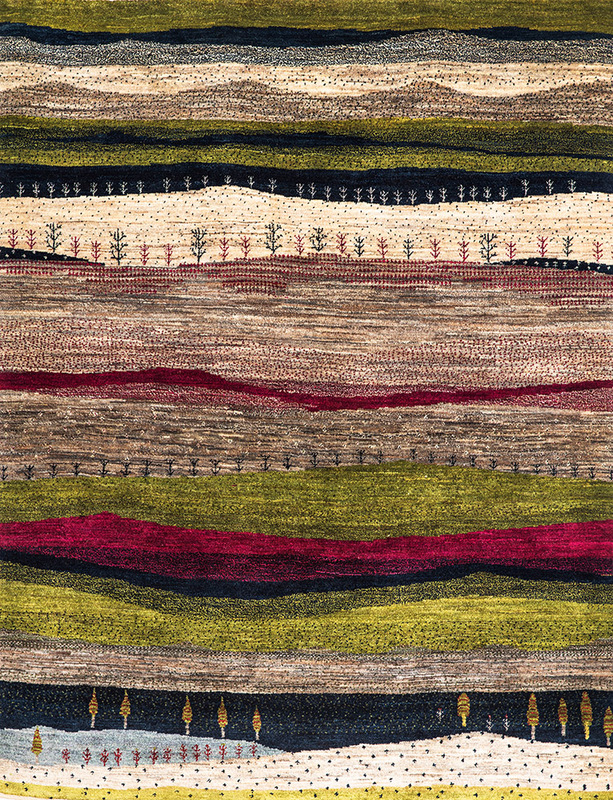 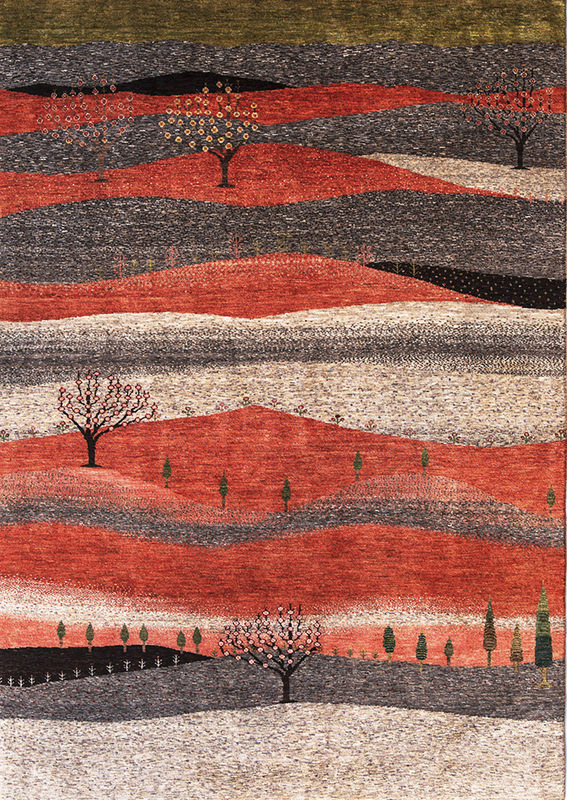 Our Landscape collection is an integral part of the Zollanvari Gabbeh range. 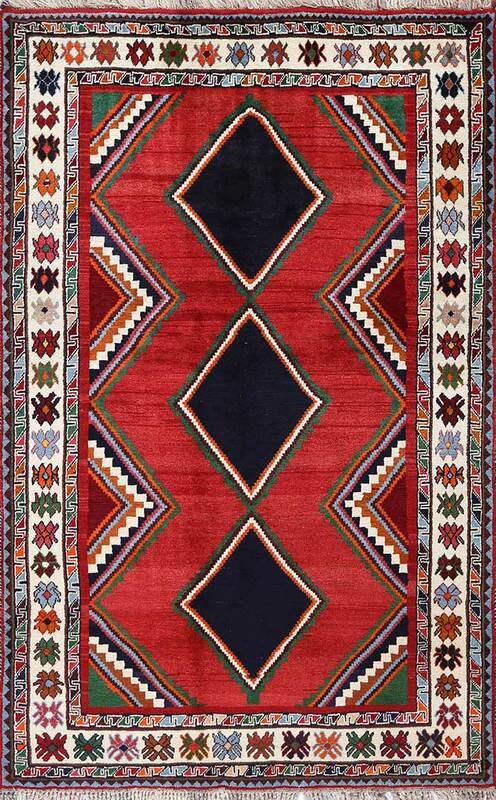 The majority are in Kashkuli quality, woven by Ghashgha’i nomads from the Fars Province, who are renowned for extremely fine carpets such as Kashkuli Bibibaff and Wasir Machsus. 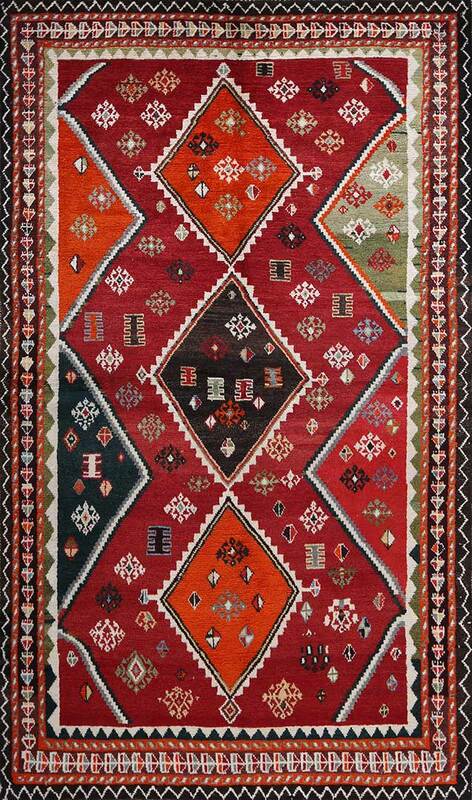 With this in mind we turned to them for the extremely demanding production of our modern Kashkuli Gabbehs. 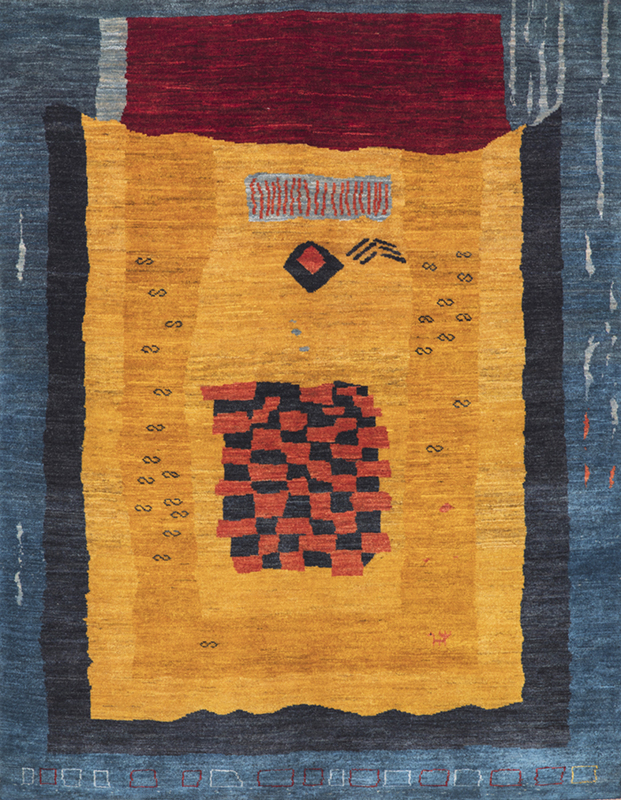 The designs and symbols used are rooted in the old Gabbeh design canon that Zollanvari have reinterpreted with a modern twist and to suit modern interiors and sensibilities. 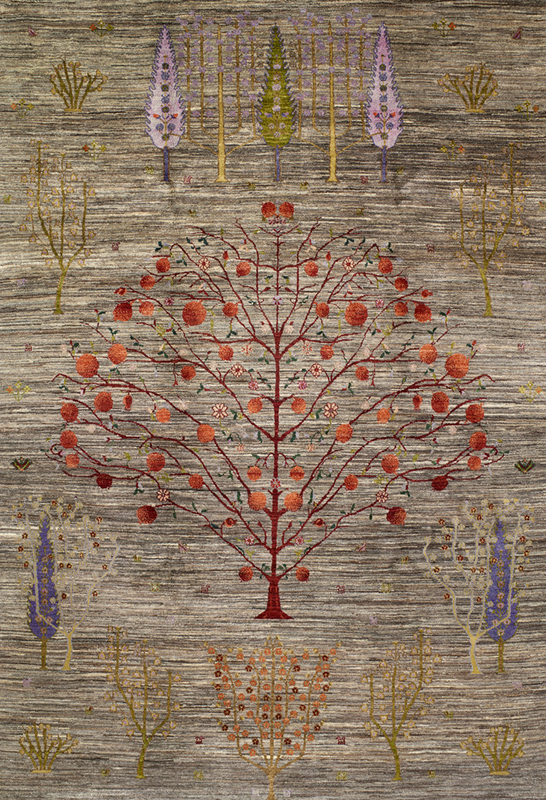 Over the thirty years since the opening of Zollanvari AG in Zurich, Reza Zollanvari has collected the finest and most unusual old and antique Gabbehs he has been able find in Iran. 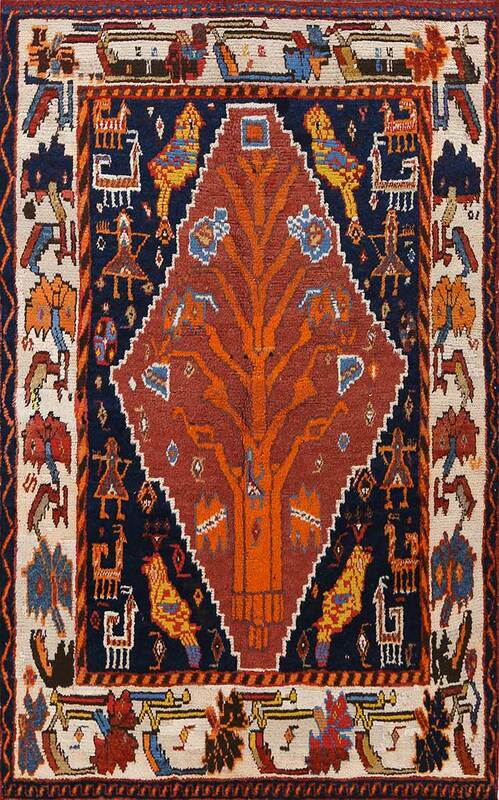 Highlights of this collection can be viewed online. 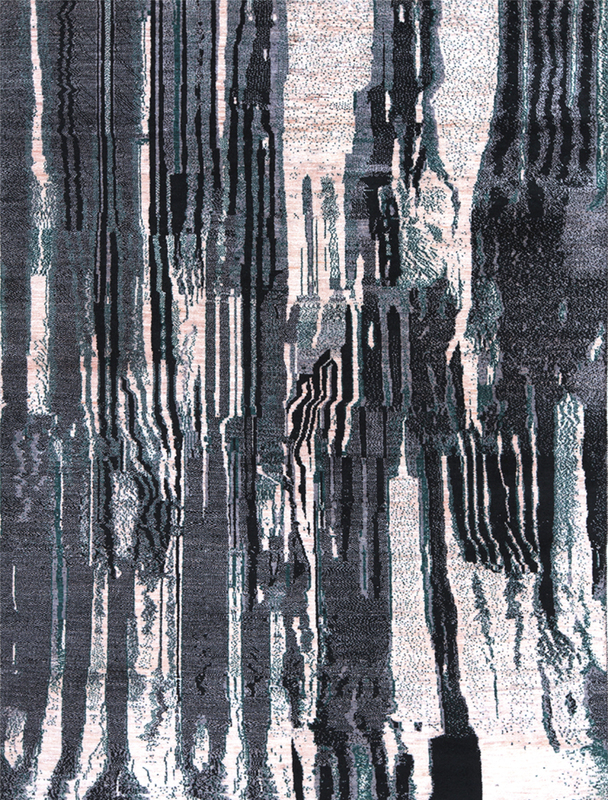 For more images and information please contact us on zollanvari@zollanvari.ch.